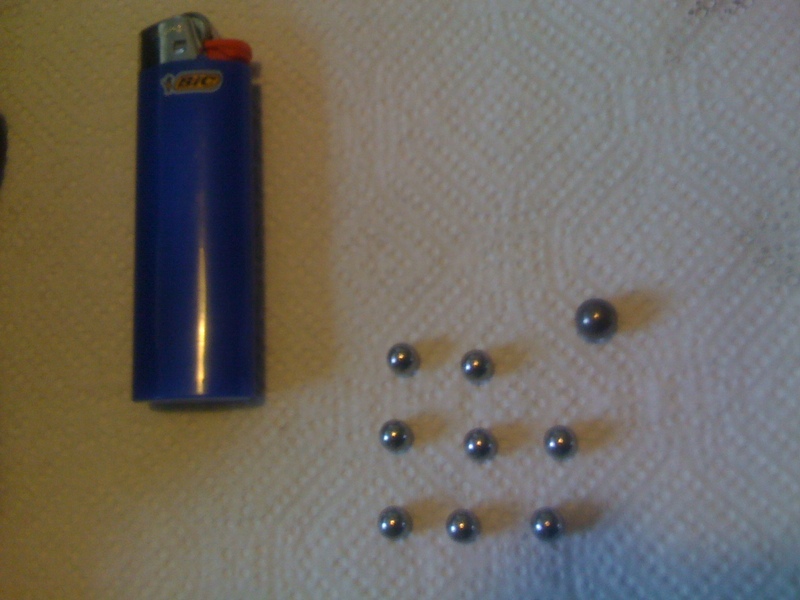 So , I guess we'll start small here , and show the Governor . 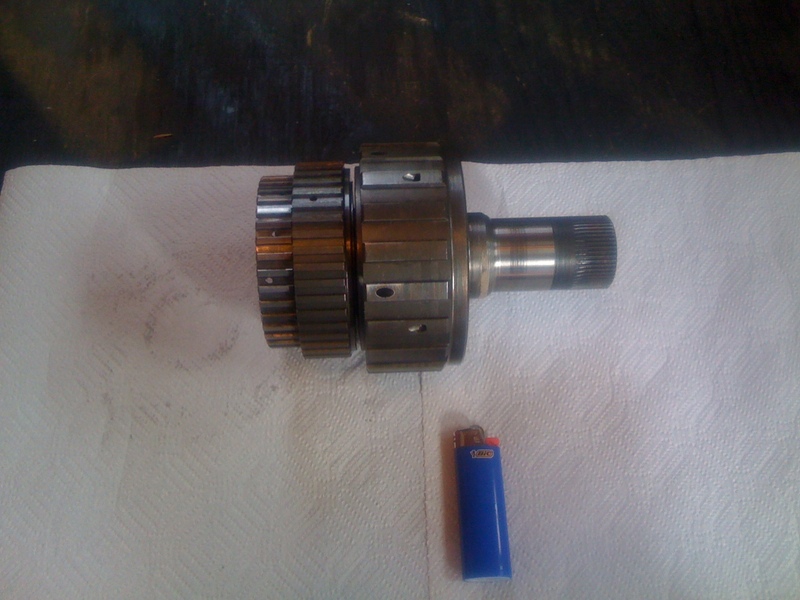 As we all know , this lives behind the tin metal cap on the driver's side just in front of the tailshaft . The cover for this was SO rusty that it literally crumbled upon removal and so is not shown . After removing the cover this just pulls out with a slight twist to unmesh the gears . Last edited by OrangeBird; 04-23-2014 at 05:45 PM. More Governor . My next post will contain the VSS , and so on untill we have shown every component . Last edited by OrangeBird; 05-01-2014 at 07:12 PM. Last edited by OrangeBird; 05-01-2014 at 07:14 PM. 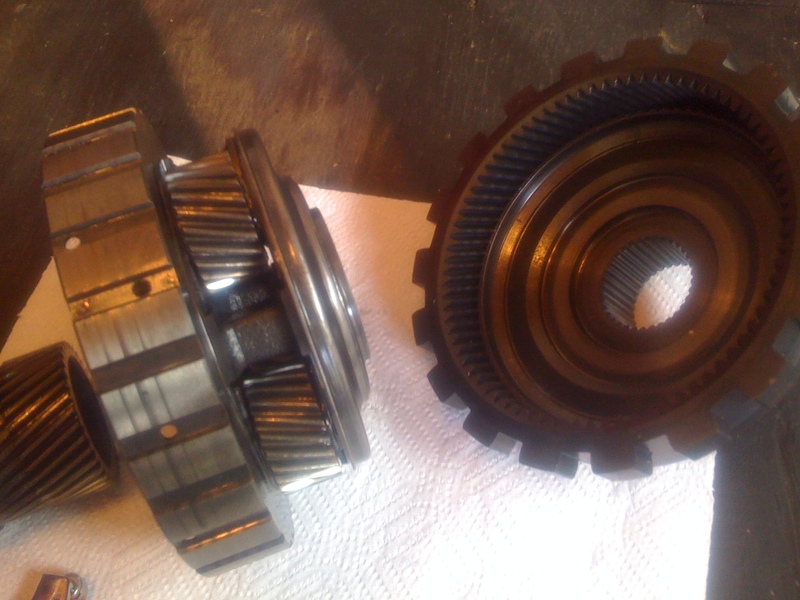 Last one of the VSS , this one with the driven gear slid off of the VSS' input shaft . Last edited by OrangeBird; 05-01-2014 at 07:16 PM. Re: PARADE REST !!!!! Pics of EVERY component of a 700R4 !! Great idea for a thread. Keep going! 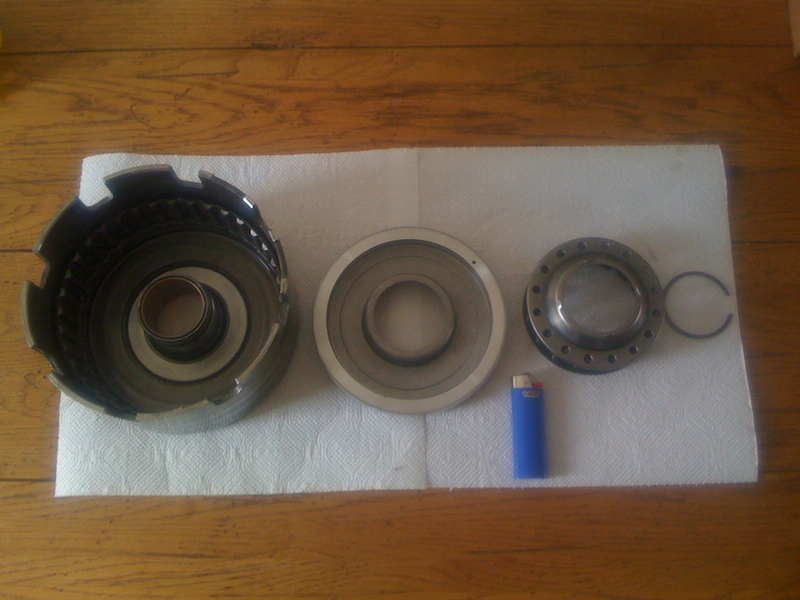 If those who know auto trannys could also comment on what needs replacing or servicing, that would be great too! Oh , I probablly should have revealed in my opening post that this 700R4 is a 1988 model and does have the metal tubing running from the pump to the aux valve body (I'm told earlier models of the 700R4 did not have this tube) ..
Ok , next up we have the Band and it's apply servo with it's cover . This is on the passenger's side and the servo is removable without going into the transmission , while the band itself does require removing the pump . 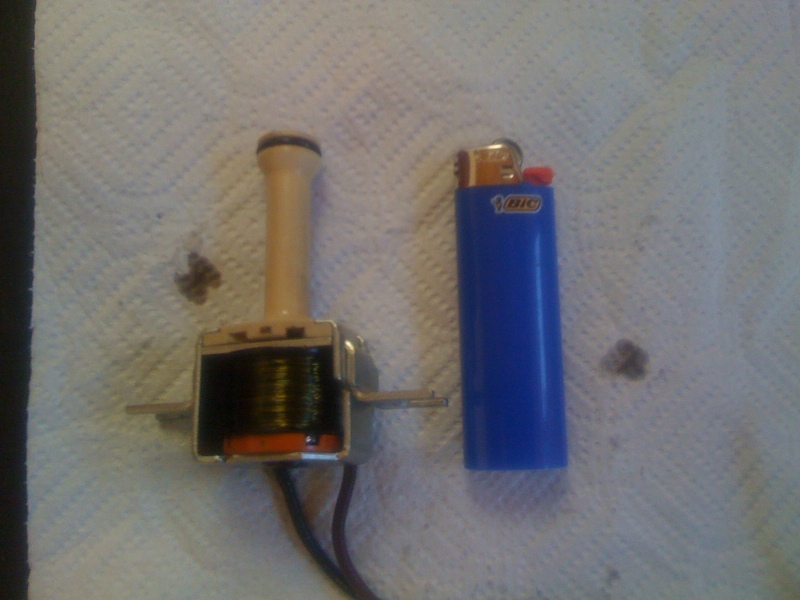 This servo is the one that folks change out with a Corvette servo for more holding power . Last edited by OrangeBird; 05-01-2014 at 07:15 PM. This post originally had a photo that was showing a mistaken placement of the servo and band . I am replacing the bad photo with a photo of some of the external hardware . Last edited by OrangeBird; 05-01-2014 at 07:11 PM. 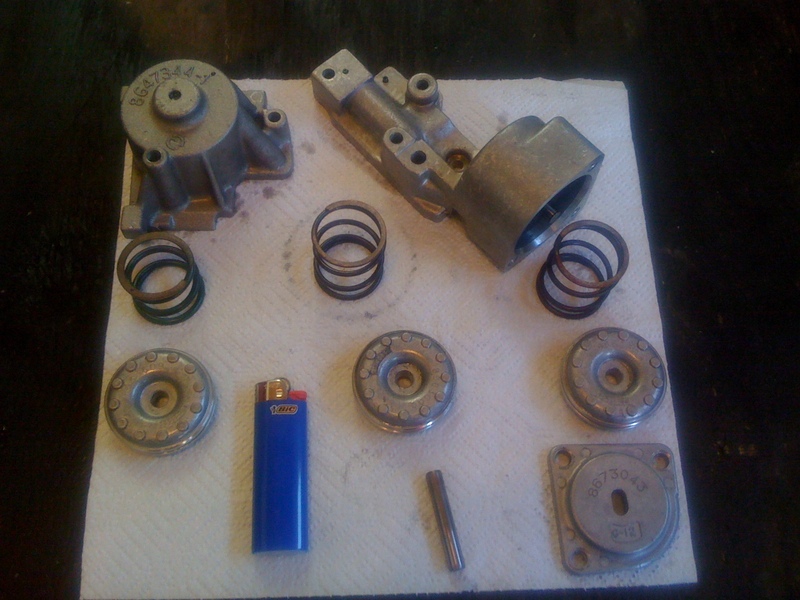 Ok , next up are 3 accumulator assemblies . I find reference on line to "1-2" and "3-4" accumulator but no identification of which is which . Also , what the third one is for . 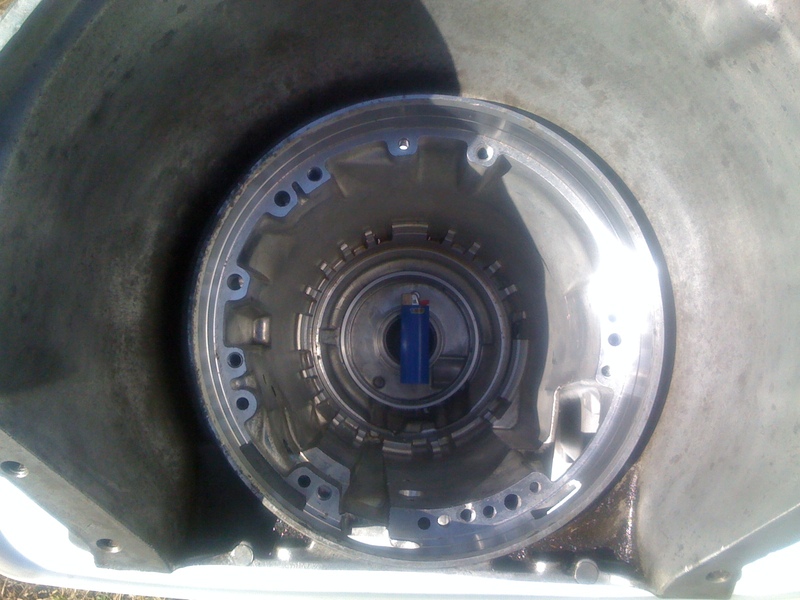 The third one that has no housing is located under the valve body separator plate and it's housing is actually the transmission case . Can any 700R4 savvy folks further identify these three accumulators ? Just to see if we can jog anyone's memory , here's a shot of where that third accumulator is located in the case . Anyone got anything on this ??? Last edited by OrangeBird; 05-01-2014 at 07:17 PM. Don't mix up the springs. 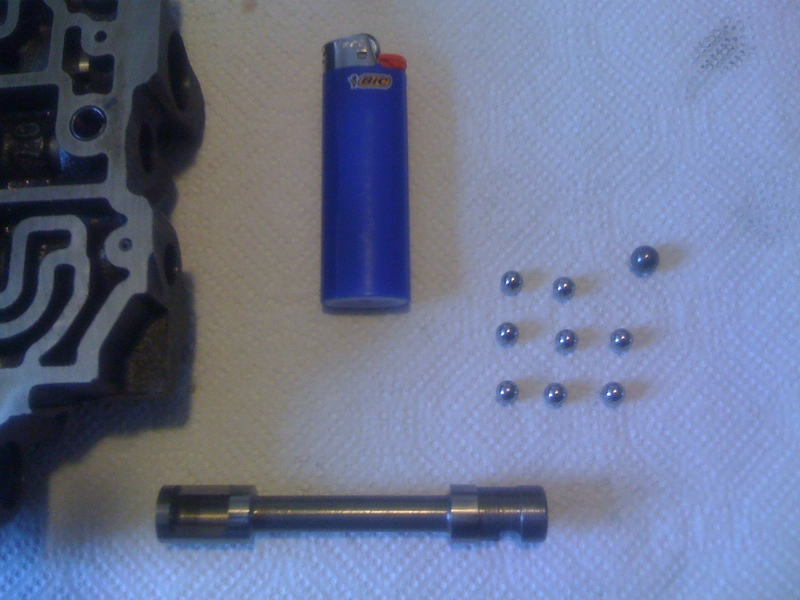 If you're rebuilding this unit, check for wear at the piston pin holes. 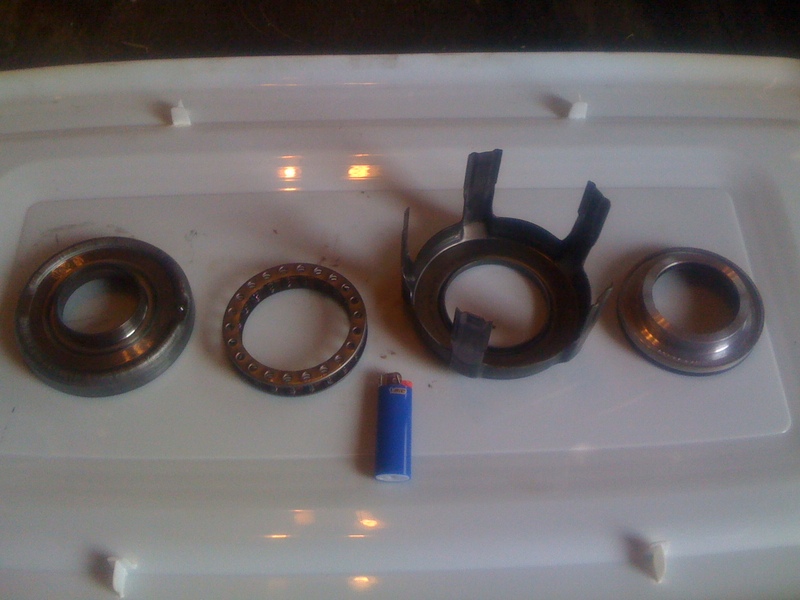 Better yet, just replace all the pistons and pins. Last edited by paulo57509; 04-21-2014 at 07:30 PM. This is where the 3-4 accumulator lives. 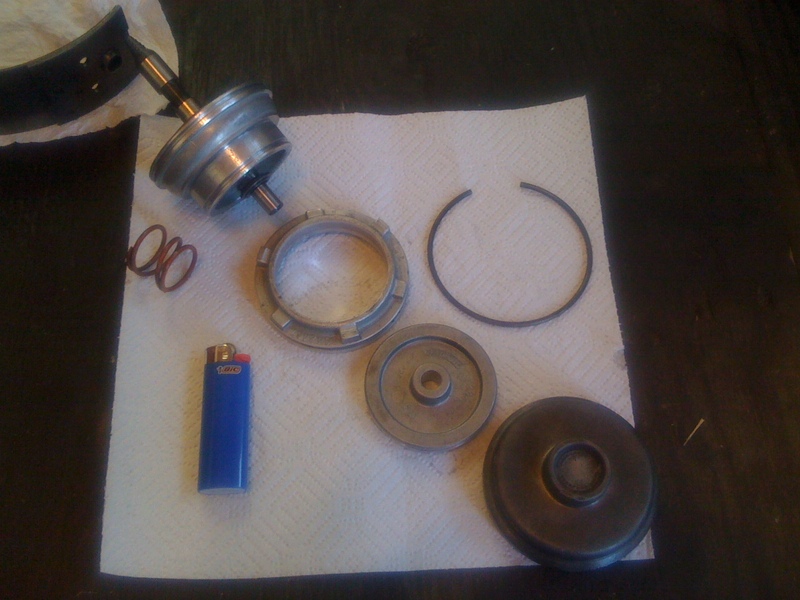 Fit the pin, then the piston (legs towards the spring) and then the spring. 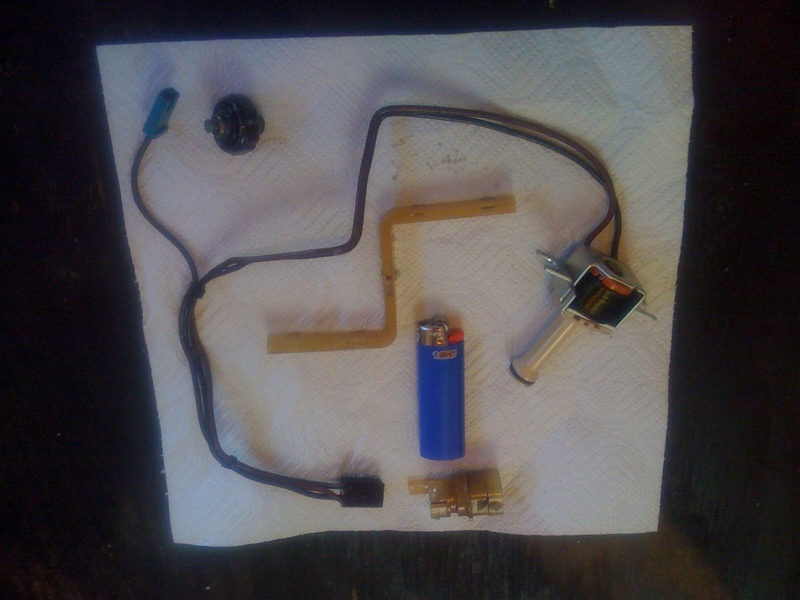 I think the aux accumulator is for when you shift from park to drive or drive to reverse or park to reverse or so. The aux acc is the one that has a seperate body in the upper right of your pics. If I remember correctly. Thank you both for your responses ! I really appreciate the identification of these three and to show my appreciation I'll jump into some REAL Gearhead territory now ... Yep , just HOW can we call ourselves Gearheads with no gears yet showing ? Well , to rectify that I now present the rear planetary set in all it's glory . 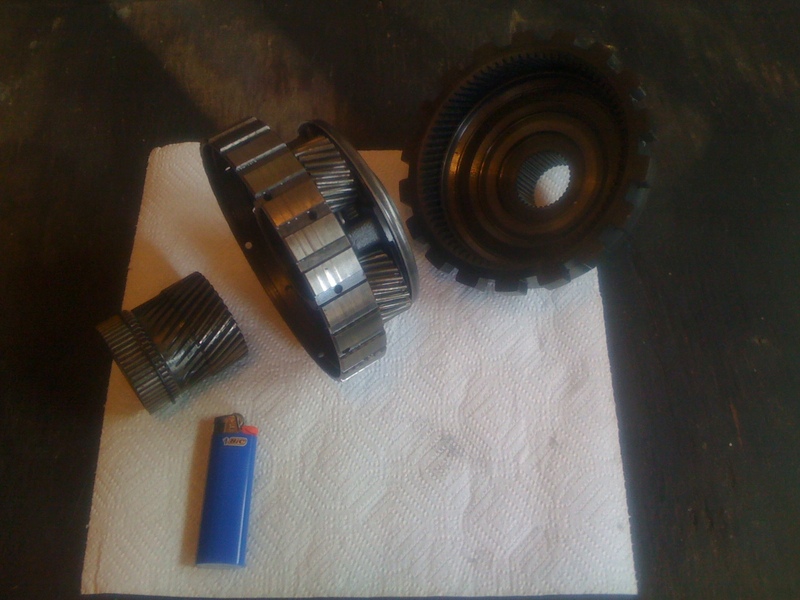 PS , to answer Paulo's question , No sir I have no plans of rebuilding this transmission , this is simply an exercise to see the parts for myself up close , and to show all my fellow third gen owners what the insides of one of these looks like . 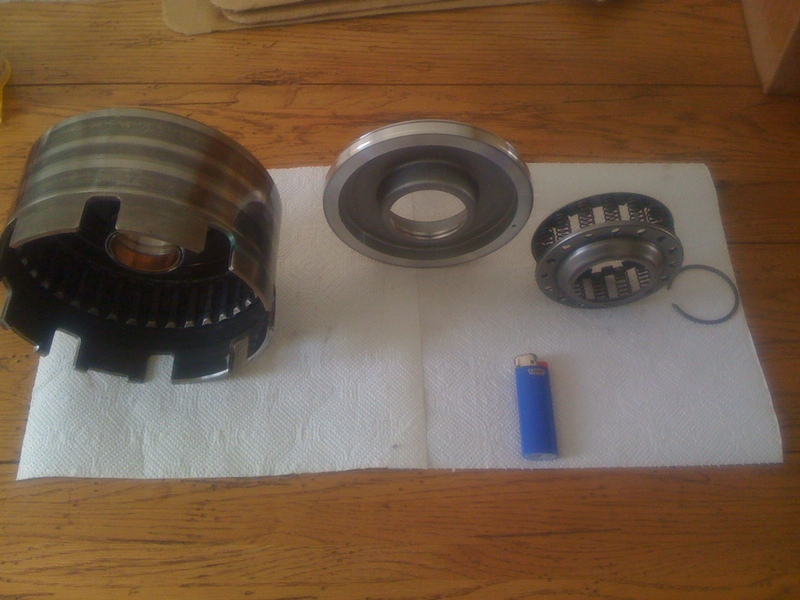 If the transmission in my car were to ever need to be rebuilt I'd buy one of those book/video tutorials and rebuild kit and rebuild the one in the car . I am carefully cleaning and boxing up each of these parts after their photoshoot and I will keep them as possible spares in the event I ever need them . Last edited by OrangeBird; 05-01-2014 at 07:18 PM. Finally found some obvious wear to show everyone ! 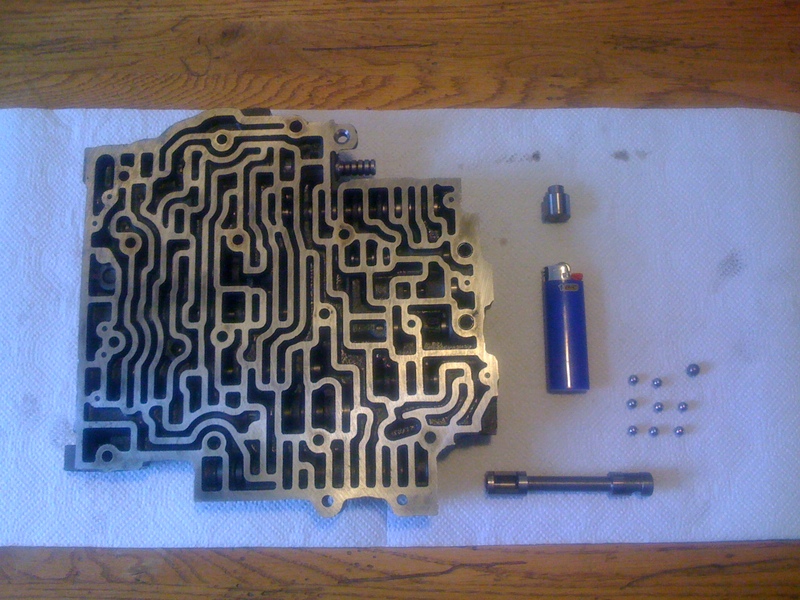 This is the metal separator plate that sits between the valve body and the transmission case . 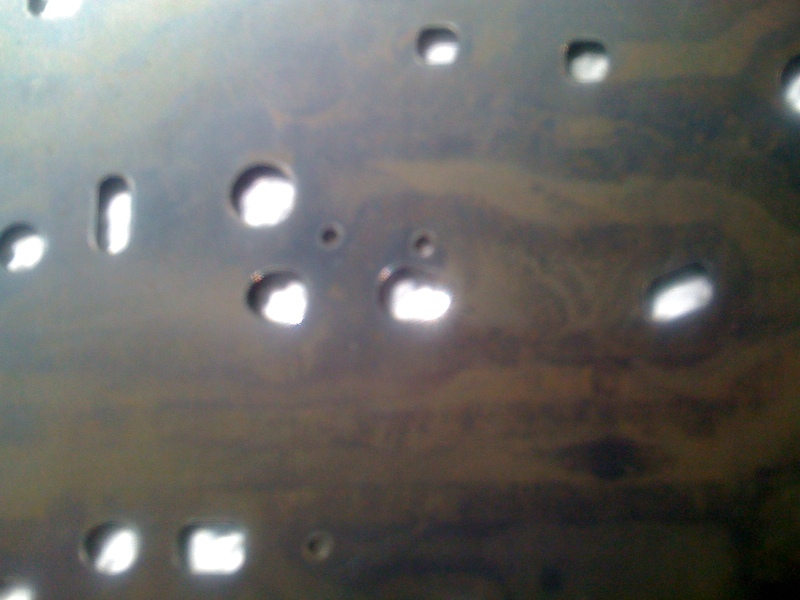 It appears that several of the small steel check ***** have worn elongated grooves into the metal that they ride against . 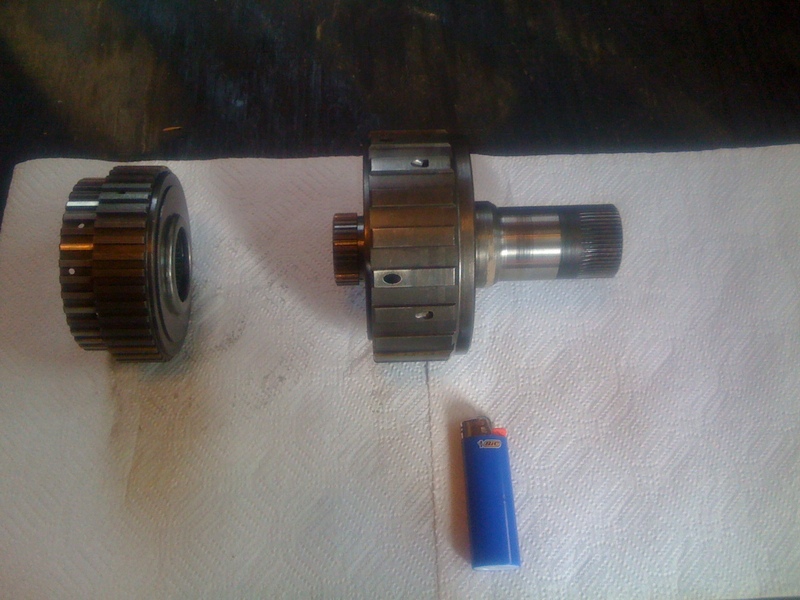 Now remember , this transmission shifted fine and so I don't think any of these had gotten to the point of jamming or sticking . Yet . 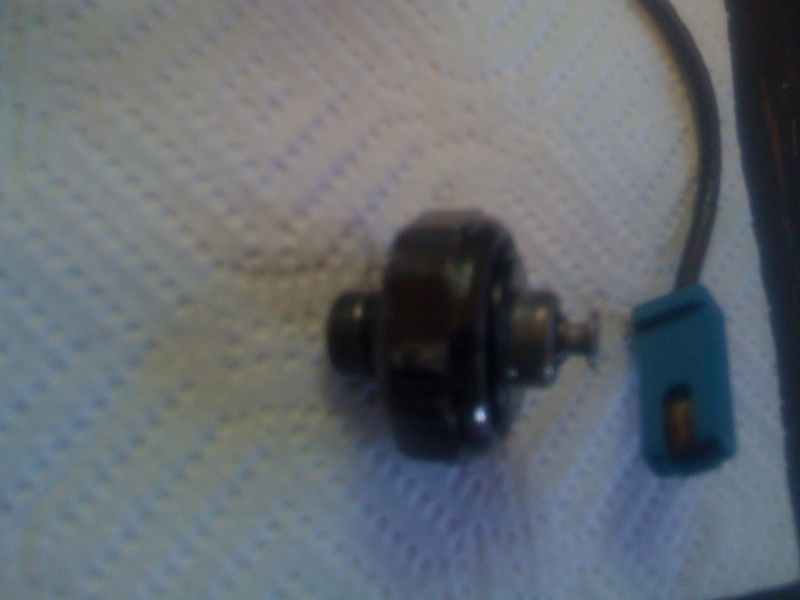 I wonder how much longer it would have been till there was SO much wear that the shifting would be compromised ? Last edited by OrangeBird; 05-01-2014 at 07:19 PM. Re: Pics of EVERY component of a 700R4 !! No one with any comments on the worn valve body separator plate ? 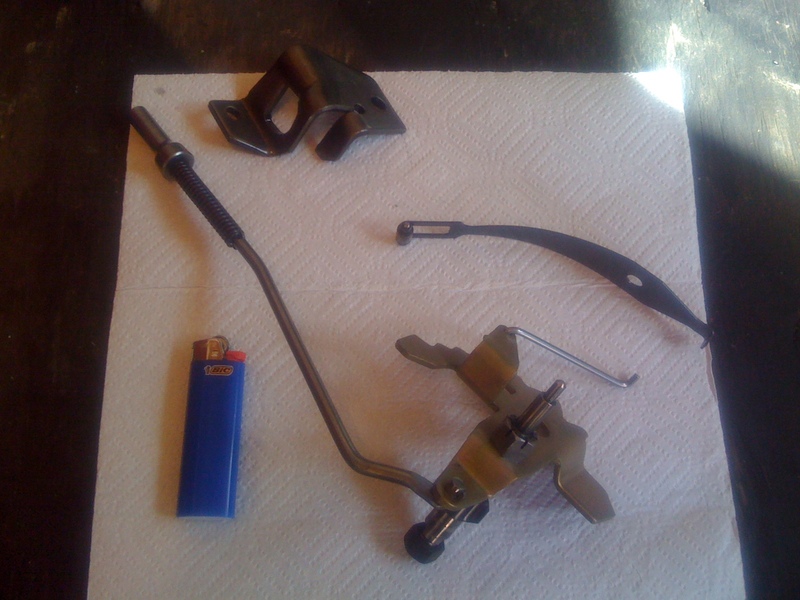 Next up we have the internal shifting linkage . 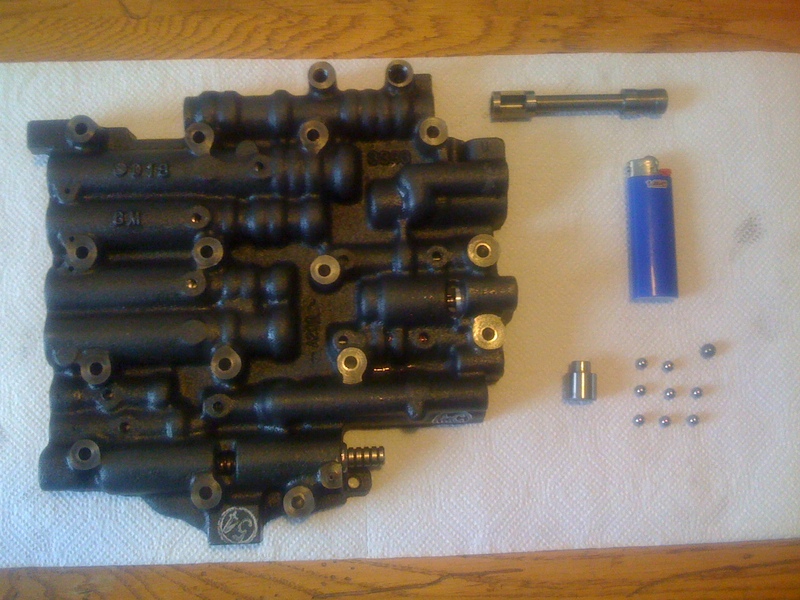 This is everything that moves inside the transmission when the shift lever in the car is moved except the actual valve in the valve body (that valve will be shown later with the rest of the valve body) . 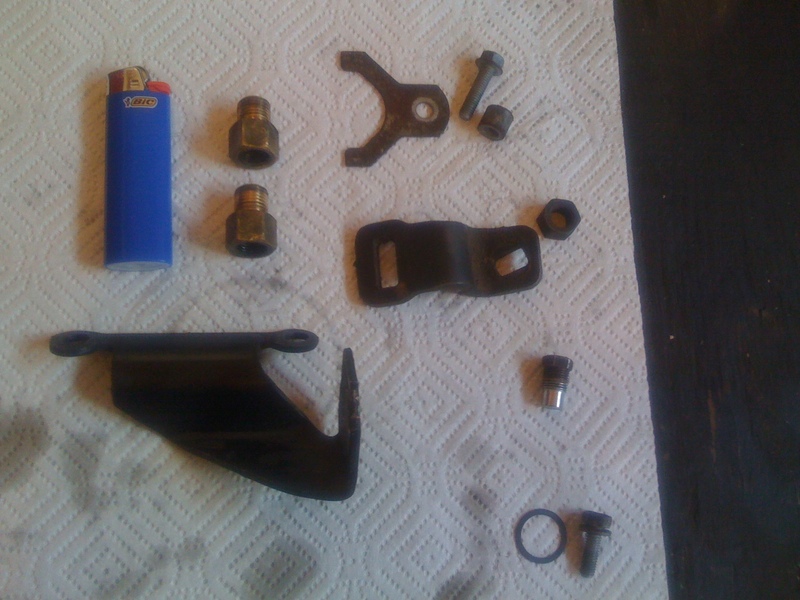 The detent spring and park pin guide bracket are shown also . This is what it looks like, you get 5 seats and clips in the kit. 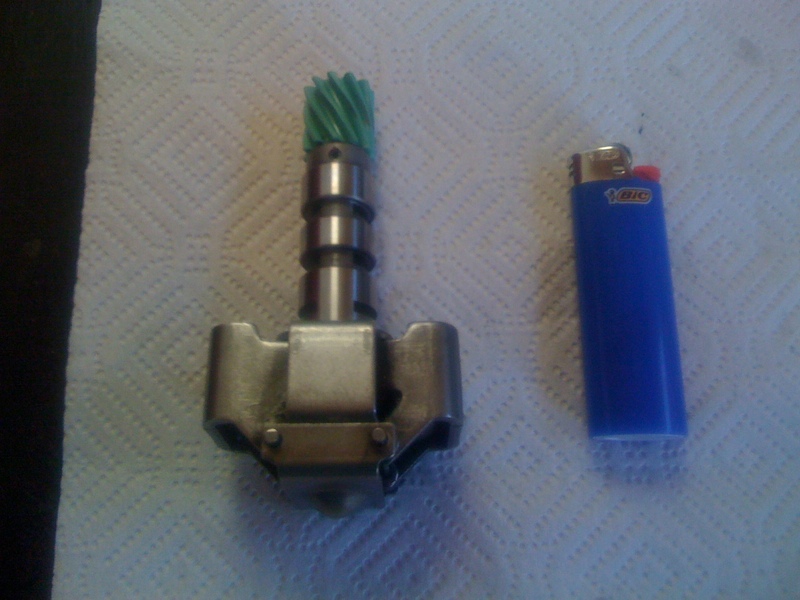 You drill the hole out to like 1/4 inch and insert the part on the right from the case side of plate and then slip the retaining clip on it from the valve body side. Proper install instruction come with the kit. 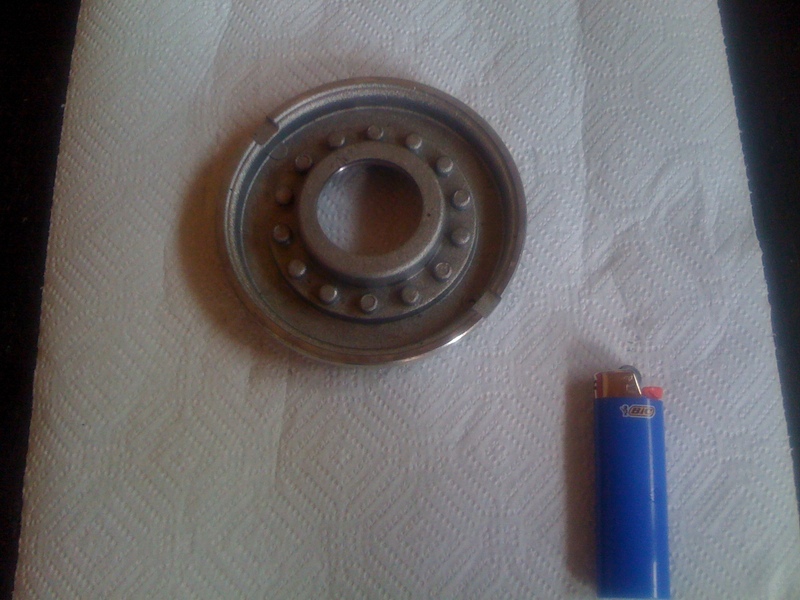 TCI sells a hardened plate which is supposed to be a bit more wear resistant. Last time I checked their plate is the same price as a new, OEM un-hardened plate. I would just go with a new OEM plate and Torlon check *****. Great info guys, this is just the kind of guide I was hoping for. Thank You both StealthESW and Paullo for the great suggestions of repairs/replacement of the damaged valve body separator plate . I really appreciate the input and it's nice to have options when it comes to fixing these things . I'd like to take a minute here and go somewhat off topic for a bit , if it's Ok with all of you . 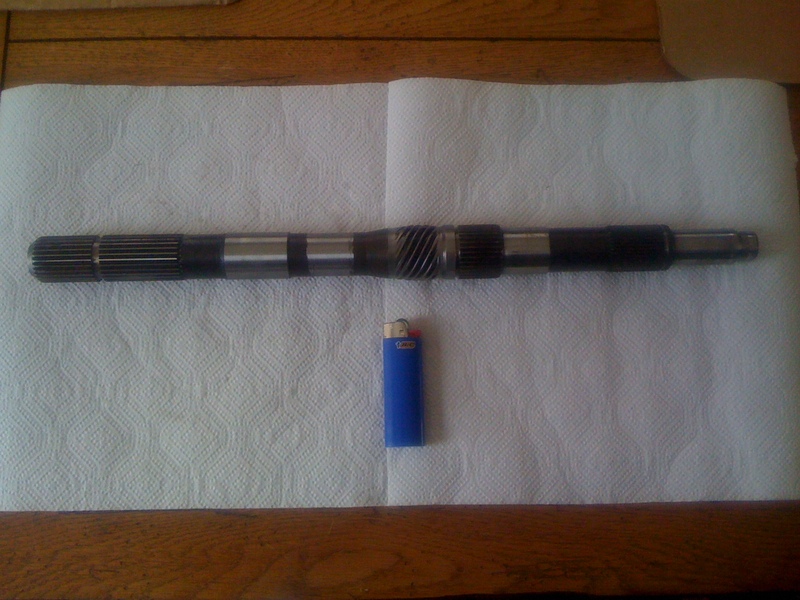 A nice polite gentleman has PMed me in inquiry as to the 41 tooth gear on my VSS . This gent seems to be having a really hard time finding one and I was hoping someone out here might have a spare one they could sell to him ? My car is a V6 and also my spare transmission that I've taken apart is from a V6 as well . It seems the V6 cars came stock with a 3:45 rear ratio and this is where he needs the 41 tooth (maybe he has swapped a 3:45 rear into his V8 car ?) . Anyway , if anyone has one please PM me and I'll forward your contact info to him . Ok , back to the photos . 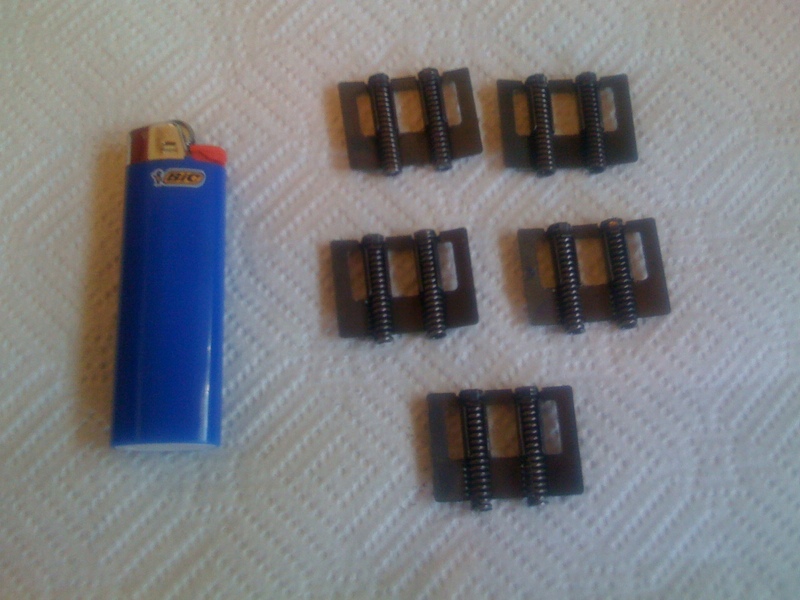 I have not shown any hardware in the form of bolts since there really isn't all that much remarkable about most of em . The exception , in my opinion , are the 7 bolts that hold the pump onto the case . 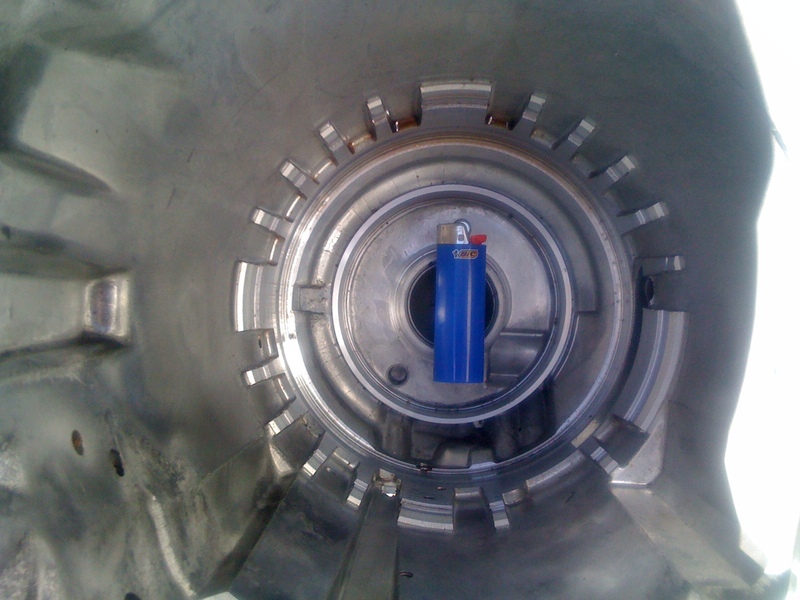 These bolts have their heads machined to accept O rings where the bolt head meets the pump housing . Interesting ... I wonder if the bolts were a problem leakage spot and thus the O rings ? 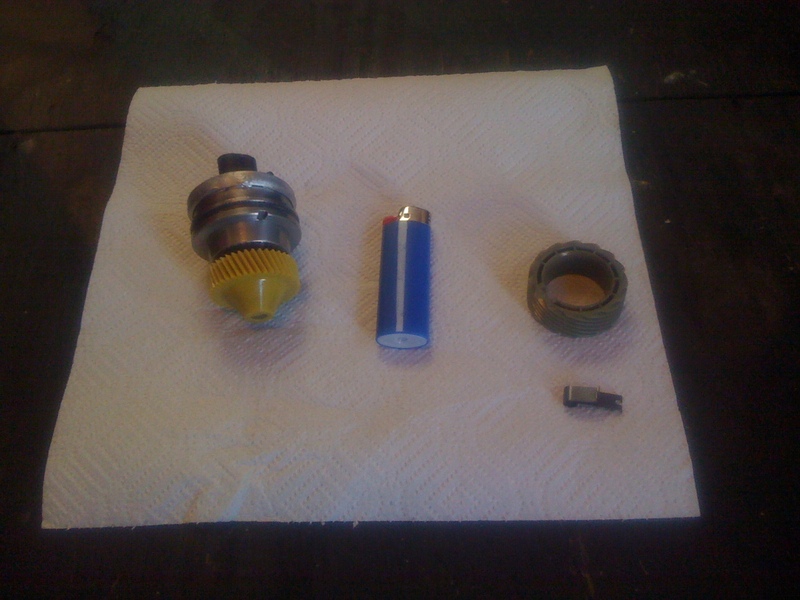 And do other transmissions have similarly machined bolts holding their pumps on ? 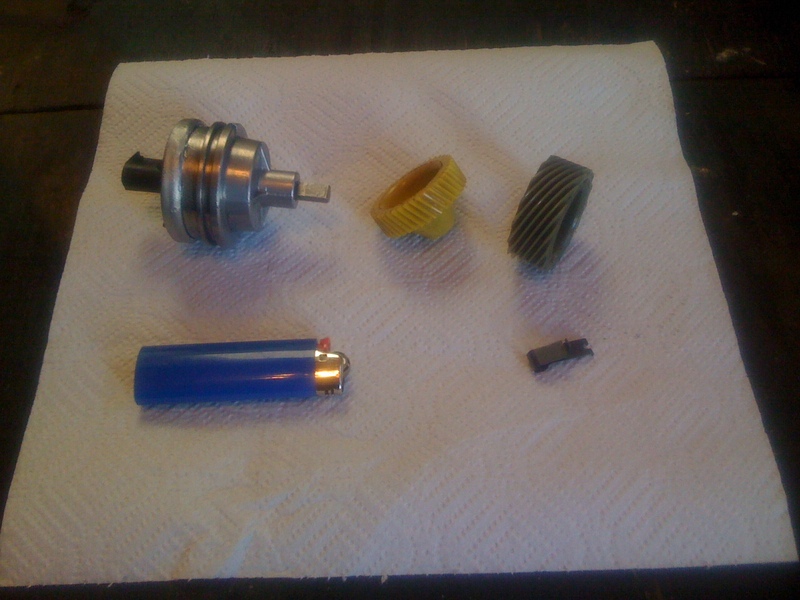 I don't know if leakage around the pump bolts was an issue (I doubt it). 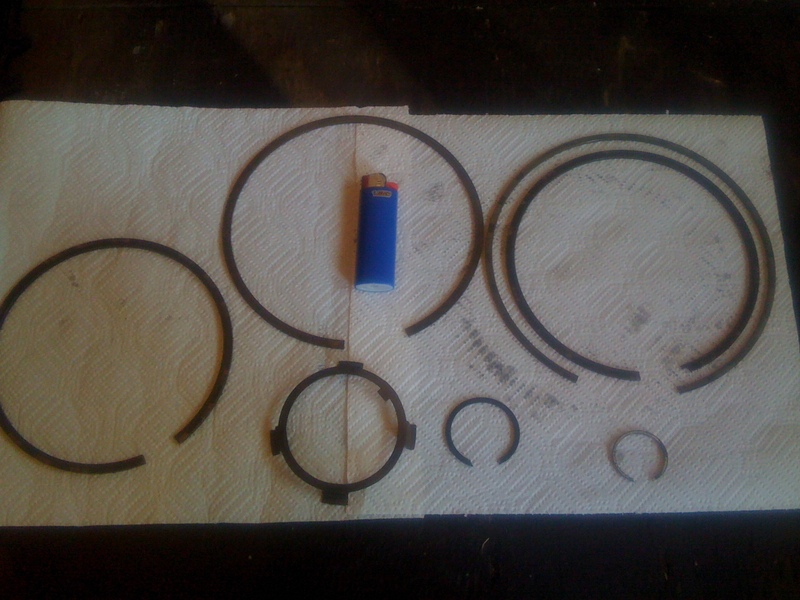 If you have the pump off the case, take a look at the pump gasket. 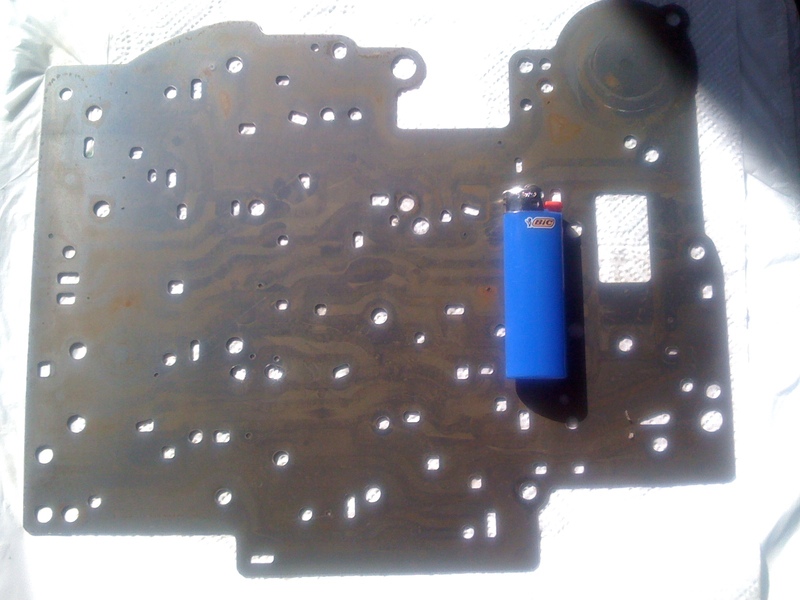 Notice that some holes in the gasket don't fully encircle some of the pump mounting holes. Makes for a nice leak path if you forget the o-rings. 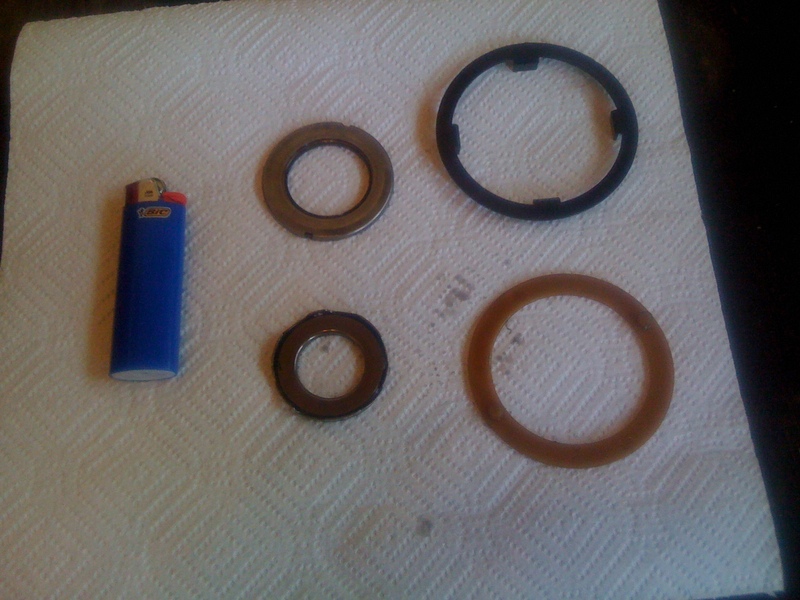 I don't have an answer for why the gasket doesn't go around each mounting hole. 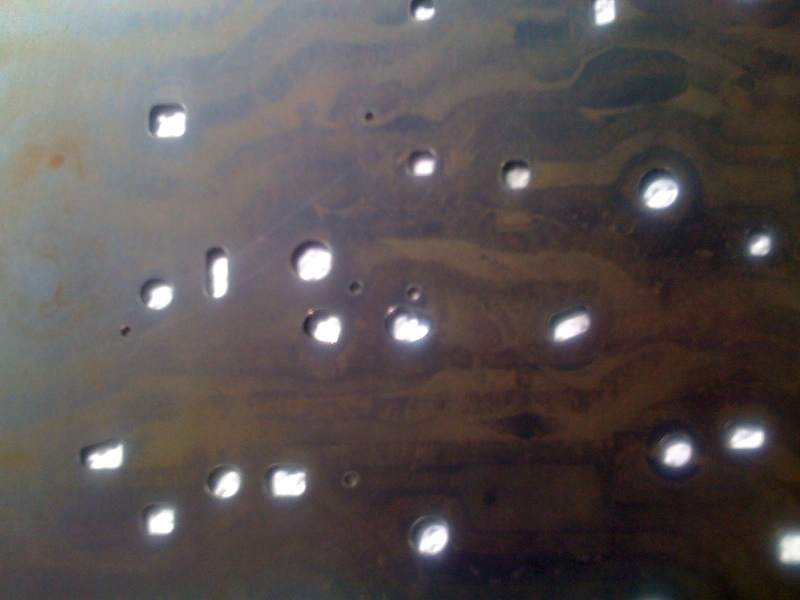 My guess is that it's used as a visual indicator; these holes in the gasket are supposed to line up around a threaded hole. 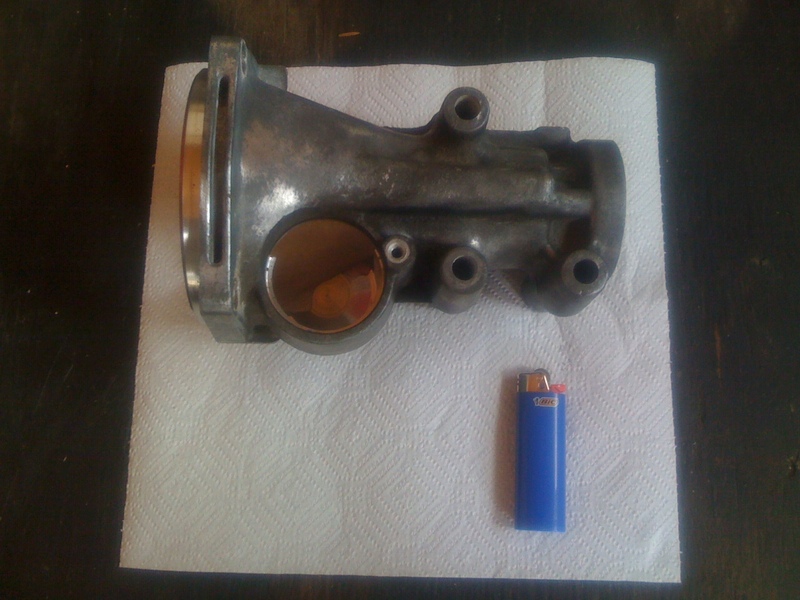 I do have it all apart and I did look at the pump to case gasket surface . 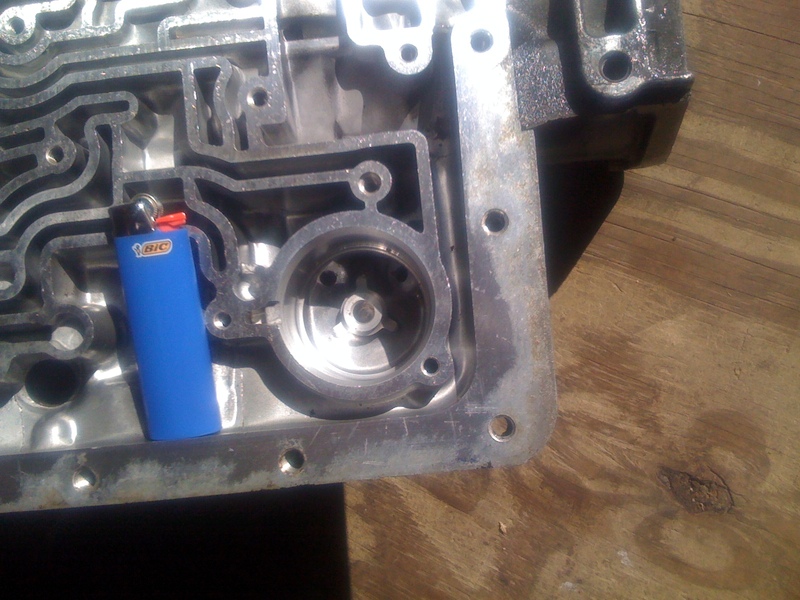 It seems the gasket's job is to keep the high pressure fluid from leaking between the pump housing on it's way to the fluid passages in the transmission case . The large O ring around the pump's perimeter seems to keep the fluid from leaking out of the case as the pump to case fitting has fluid behind it as well . When I get the pump photos up I'll be sure to get some of where the pump sits into the case also . 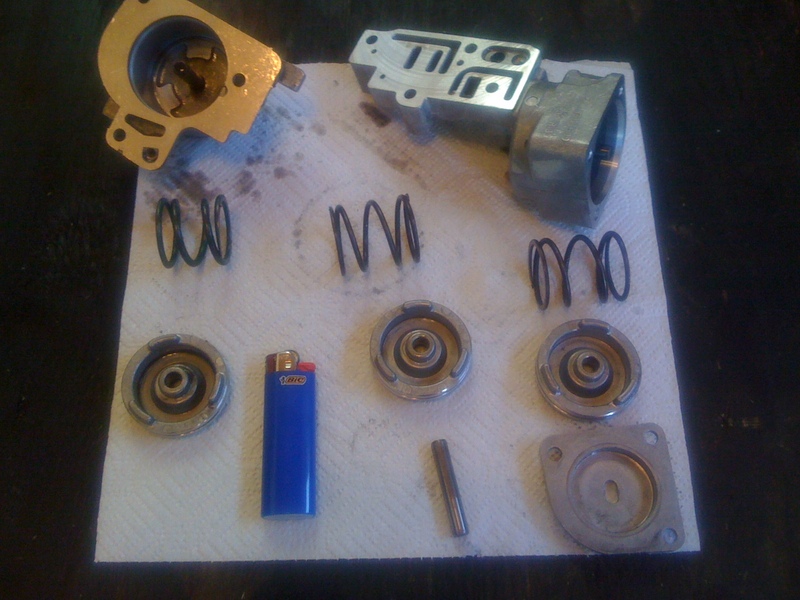 Ok , anyway , the next pics are more specialized hardware type parts in the form of retaining rings and thrust washers and thrust bearings . 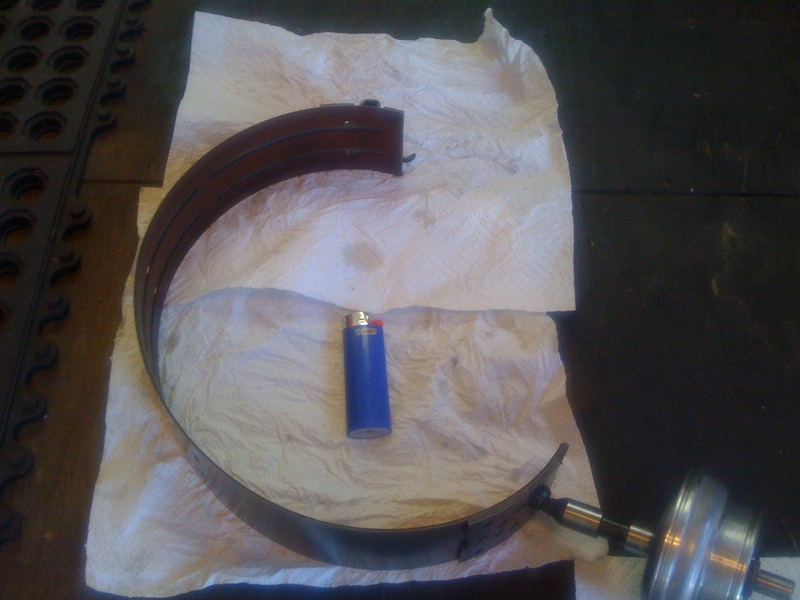 There is usually some spring pressure involved in removing some of these retaining rings and in fact I managed to not only drop but also step on one of the clutch spring sets which I'll show in this set of pictures as well . This spring set and the governor cover were the only two things destroyed while taking this 700R4 apart , I'm happy to report . 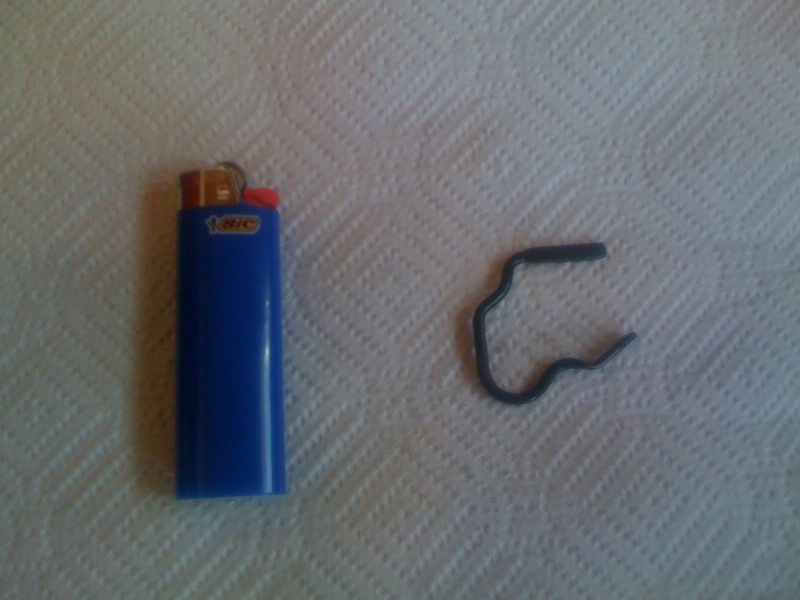 Here are two parts that I remember removing , but I can't quite remember from where . 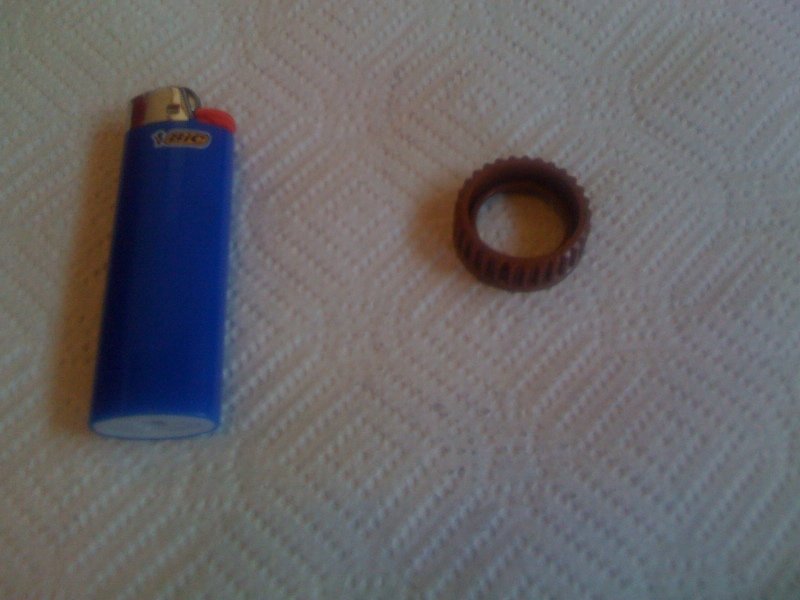 One is a retainer of some sort and one is a small brown gear . 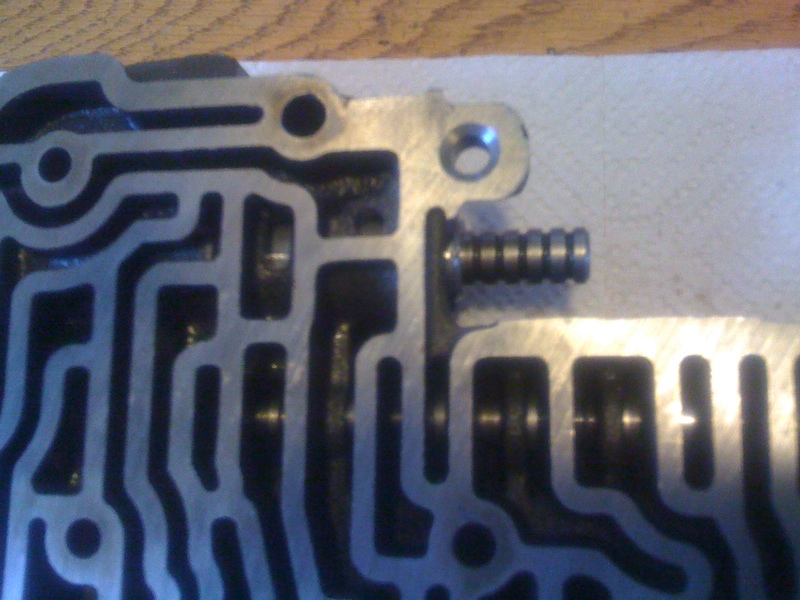 The metal clip is actually the anti-clunk spring. 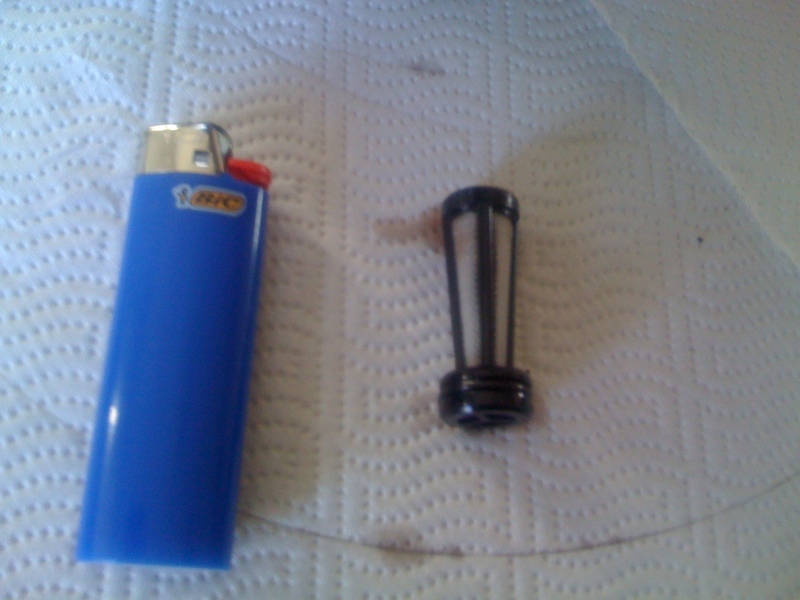 It sits on a little ridge in the case and the seprator plate sort of sits on it. 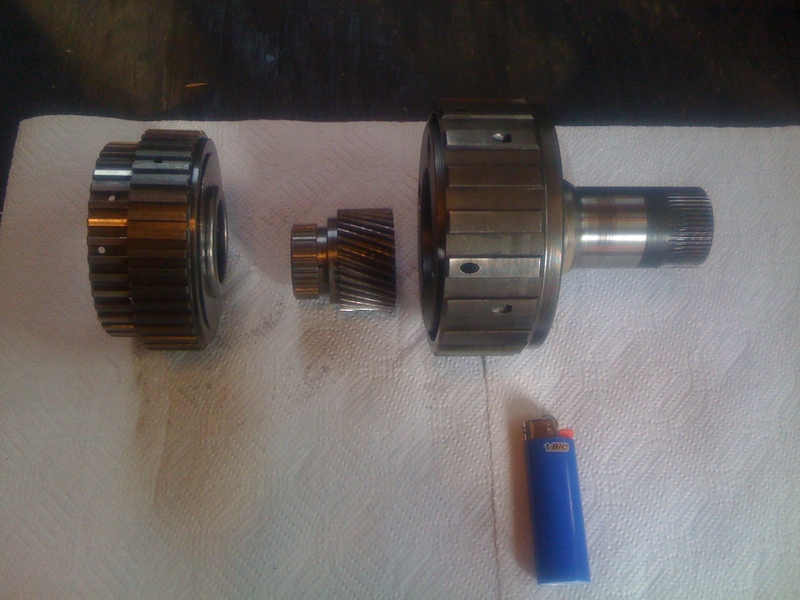 The small gear is actually a seal that goes between the input shaft and the output shaft. 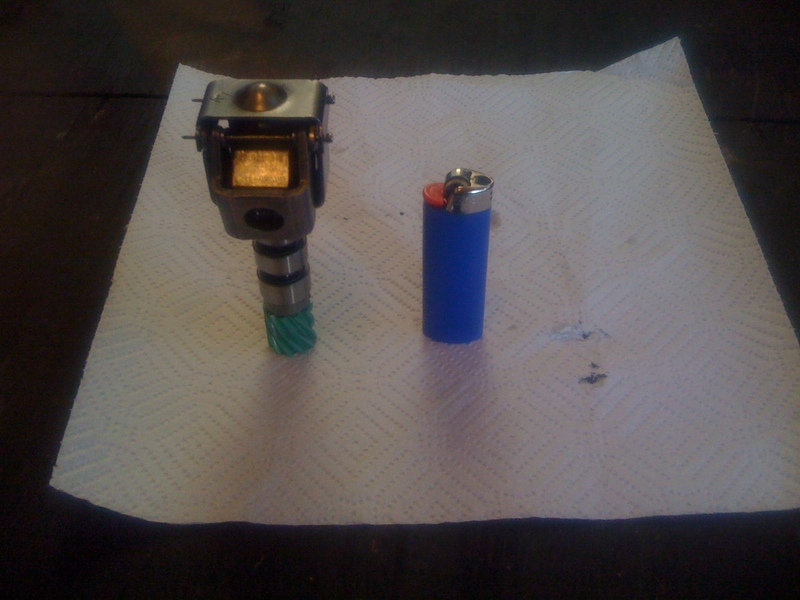 Your photo is showing the servo pin connection incorrectly. The servo pin engages the bracket on the opposite end of the band. 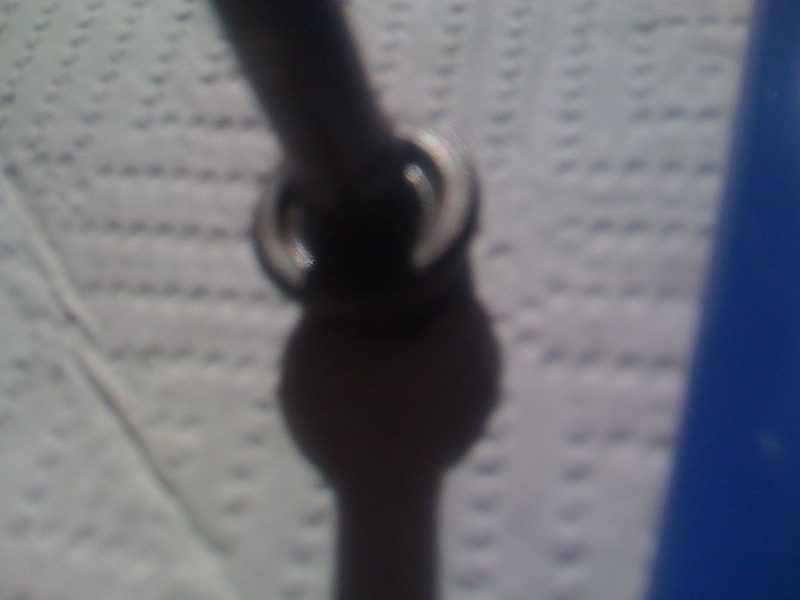 The case anchor pin is what contacts the hole in the flat bracket on the band. Last edited by StealthESW; 04-27-2014 at 10:35 PM. Thank You Stealth ESW for the correction ! If any of my photos are incorrect I really appreciate being told so that we don't have bad information . Here's the thing ..... 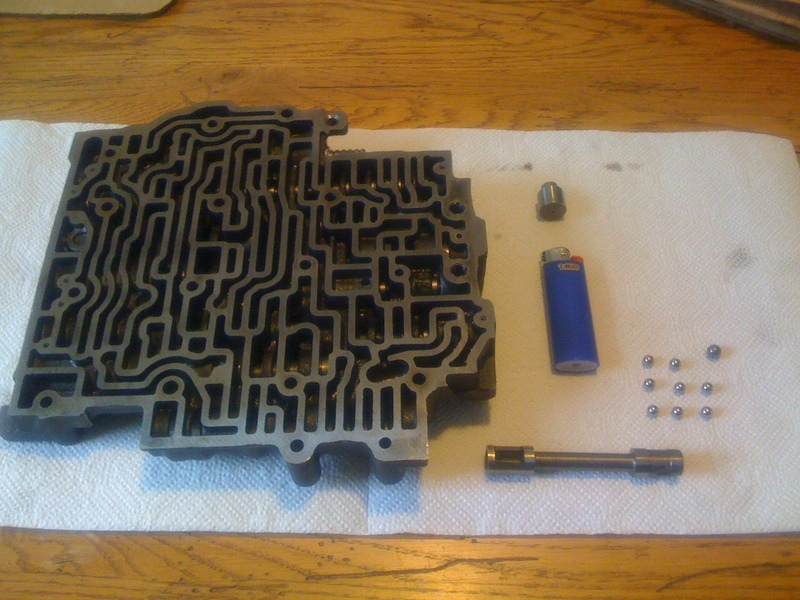 It's been a while since I took this apart and because this is the first time I've ever taken one of these this far apart , I have to rely on my recollections of where exactly everything was . 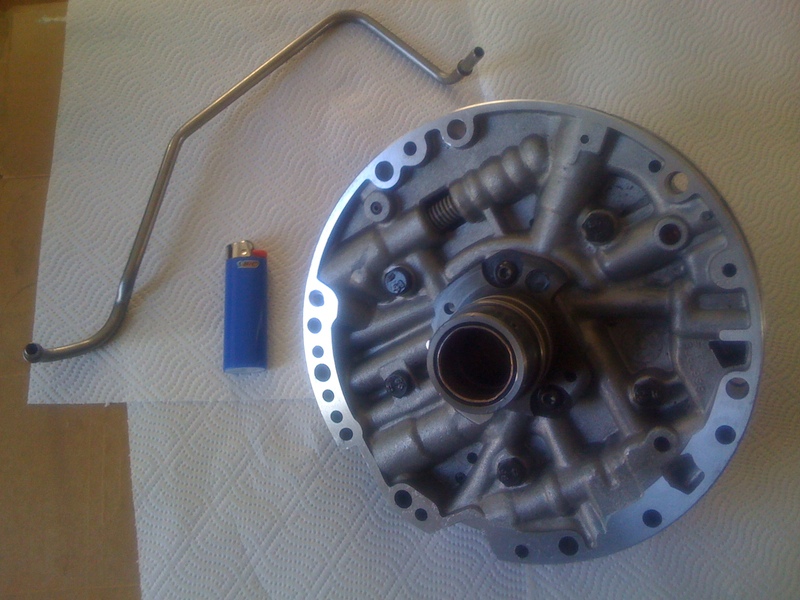 Up till now I had previously done such things as new pump gaskets and maybe a rear seal or two but this is as deep as I've ever seen into any automatic transmission . This sat around a month or few before I got the idea to show pictures of all of it and that's why if something isn't dead obvious there is the chance I may get it wrong . Last edited by OrangeBird; 05-01-2014 at 07:39 PM. And also . 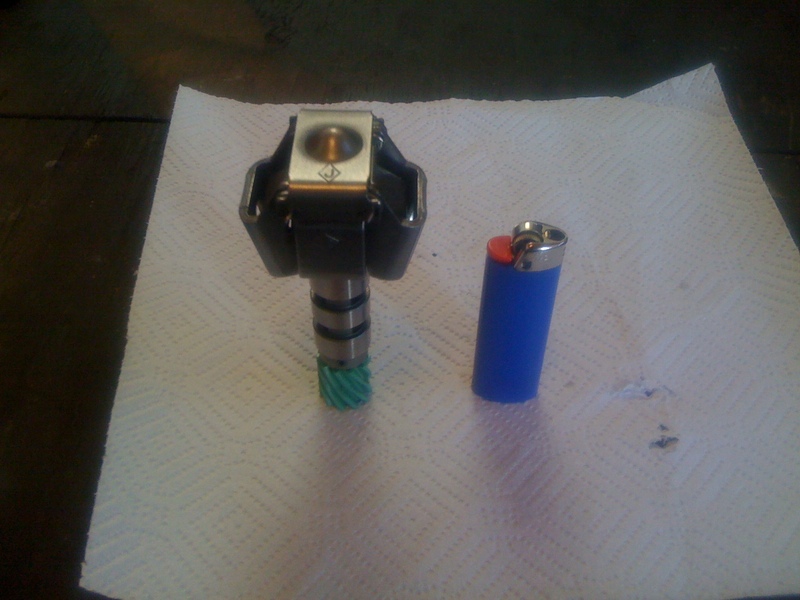 Is the "case anchor pin" the thing I have pictured here with the valve body and it's check Ball.s ? 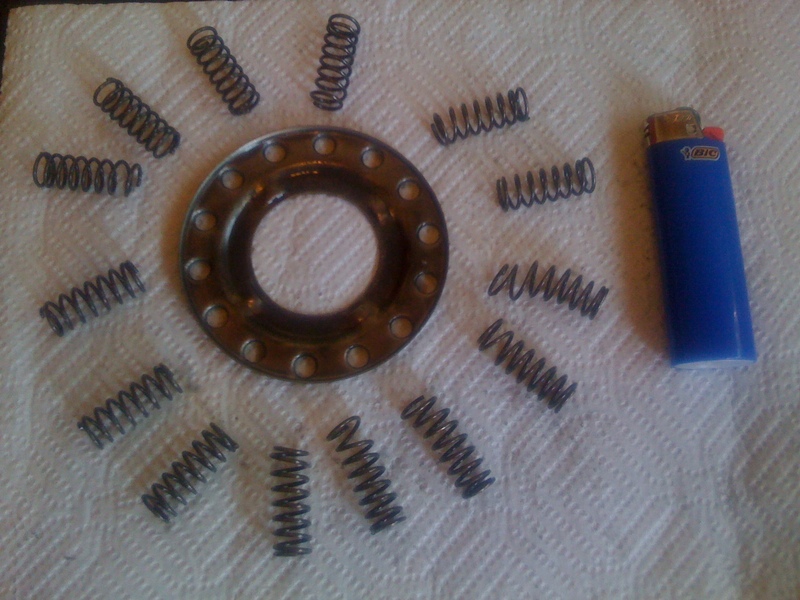 Anti-clunk spring and its location. 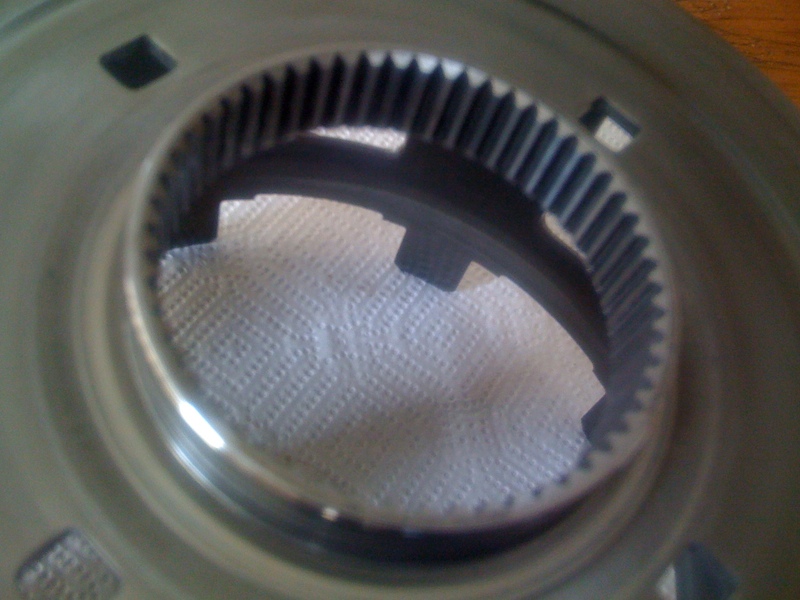 It's wedged between the case and low/reverse clutch support (center support) and is held in with the low/reverse support retainer ring. 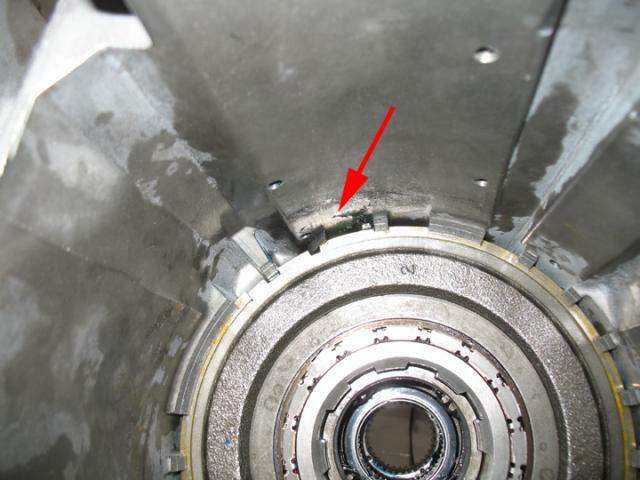 Input shaft to output shaft seal and its location in the input housing. 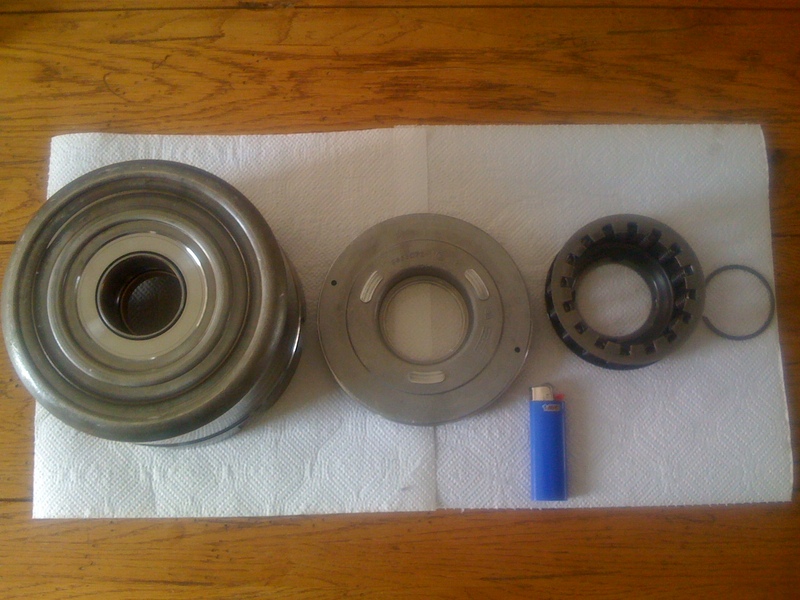 If you ever think of putting it back together, get one of these depending on the model year of your transmission. Well worth the money. Get the update edition as well. 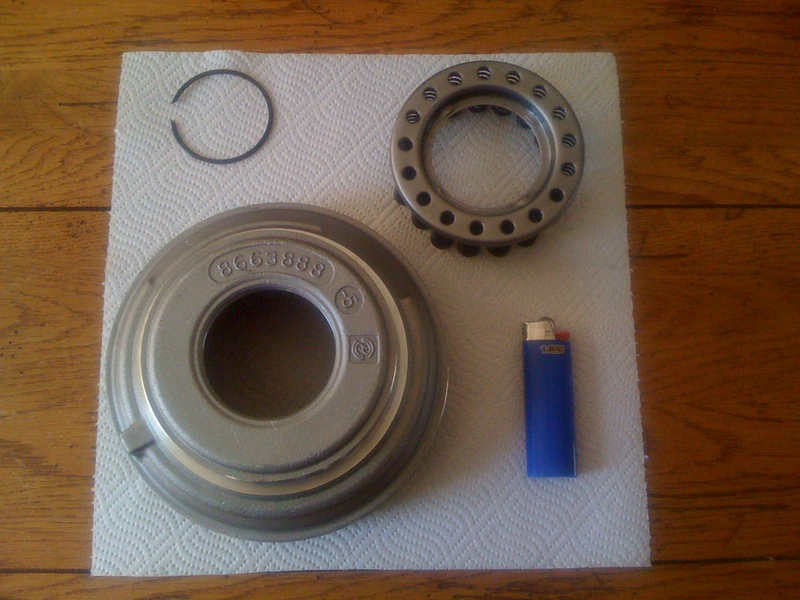 There is a one way clutch built into the first hub that is shown removed in the photos . By one way I mean that it will "free wheel" in one direction and spin both the inner and outer sections in the other direction . 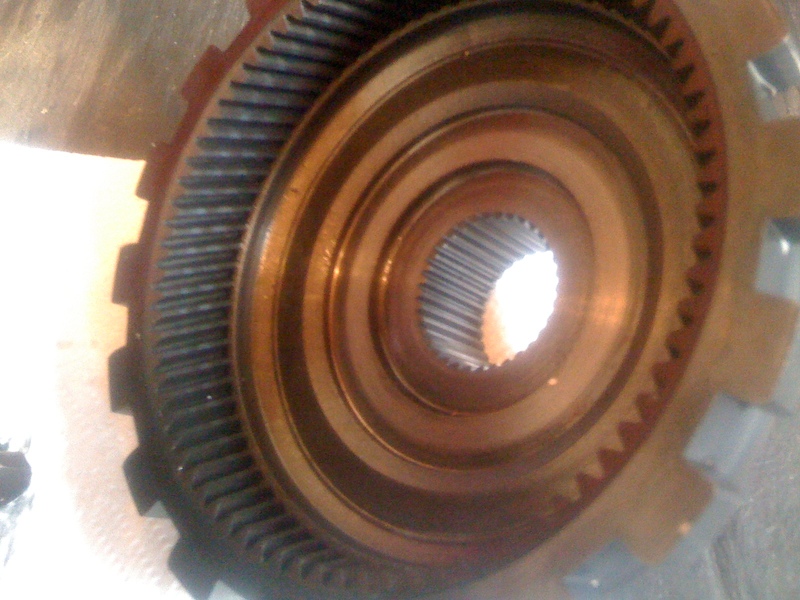 I have heard such mechanism referred to in the past as an "overrunning clutch" , but I have not found that term being used for this unit . 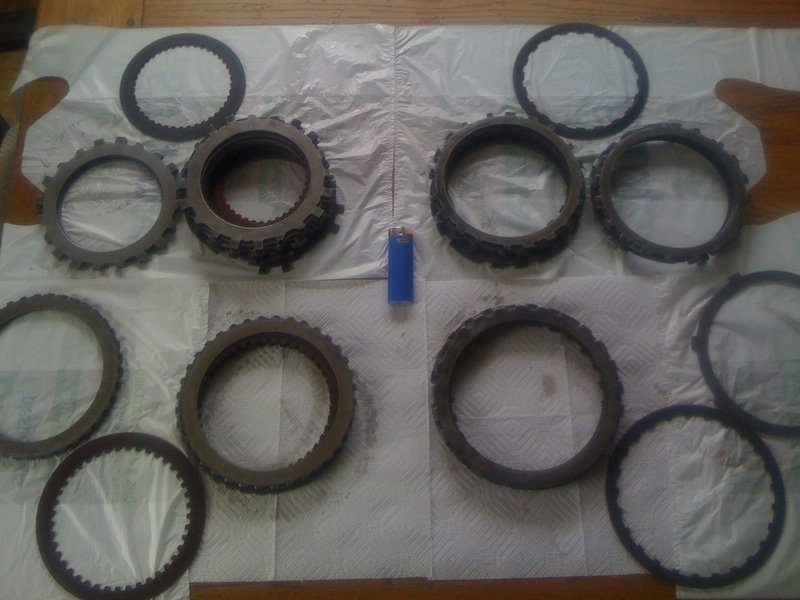 I have found the term "Sprag" and am wondering if this is what's being referred to ? Yes. 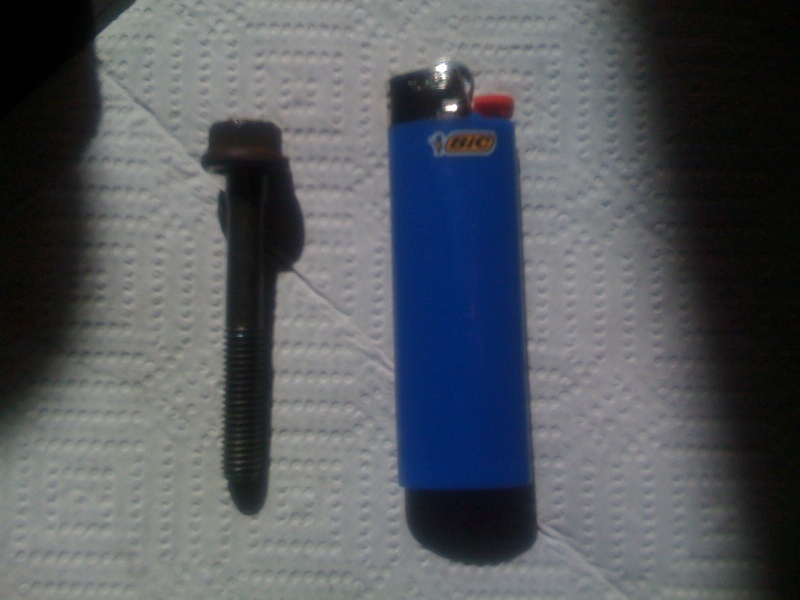 The case anchor pin is in these photos. This is a great thread. I just finished a '92 4L60 rebuild for my '84 Berlinetta. This thread is giving me flashbacks. Hi StealthESW , Thank You for the compliment . I am hoping to get this thread made into a sticky after I get all of the pictures posted up . I really hope the pictures prove helpful to folks who are wondering what the parts look like but have never had the chance to see them . Hey , speaking of pictures , here's some of the front drum that the band grabs on to . 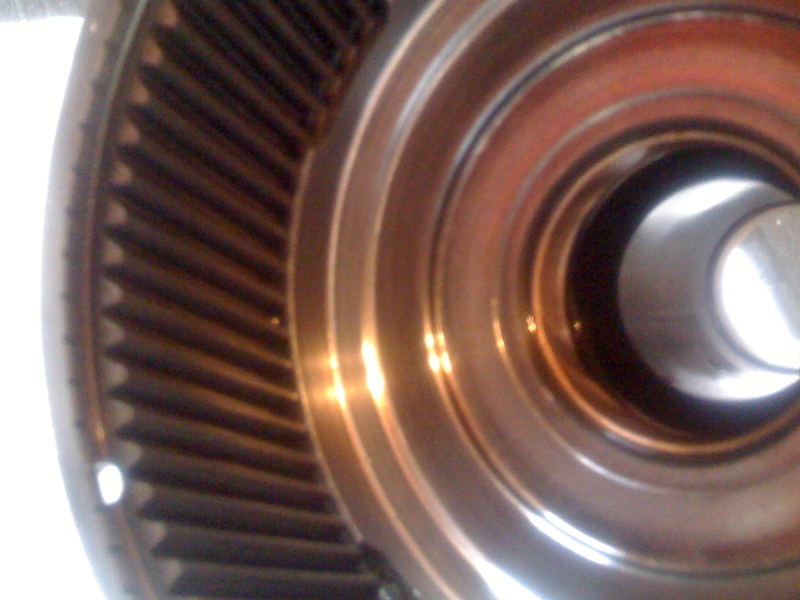 The end of this drum is the first thing that's visible inside the transmission when the pump is removed . 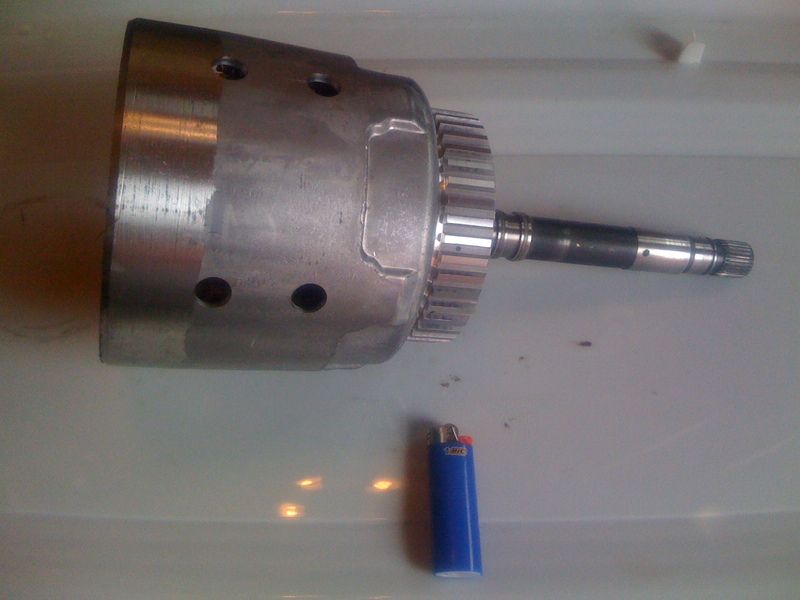 It will , of course , have the input shaft sticking out of it , which will be shown later along with the drum the input shaft is pressed into , which fits behind/inside this one . 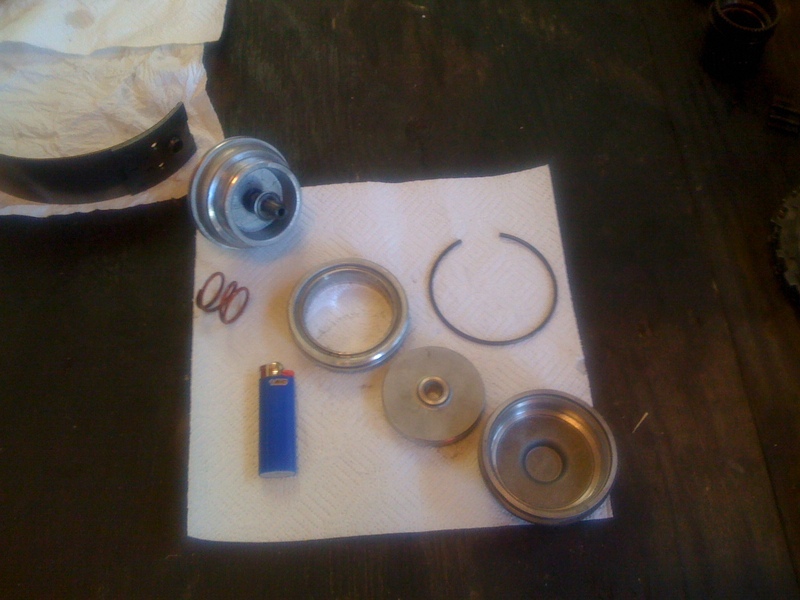 The piston shown was affixed with one REALLY strong spring set and so I imagine it took quite some fluid pressure to overcome those springs to move the piston ? He has a book to help with that. 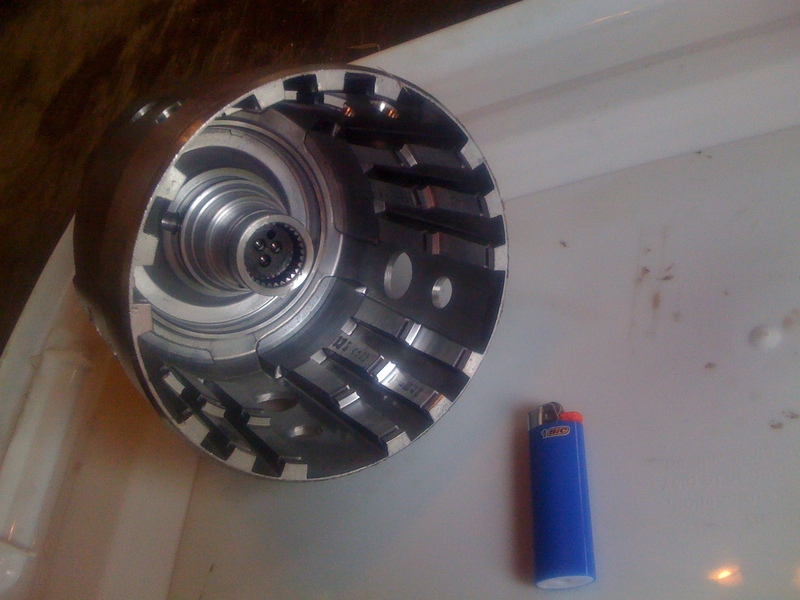 And one last one of Input drum parts , along with two of the output shaft . 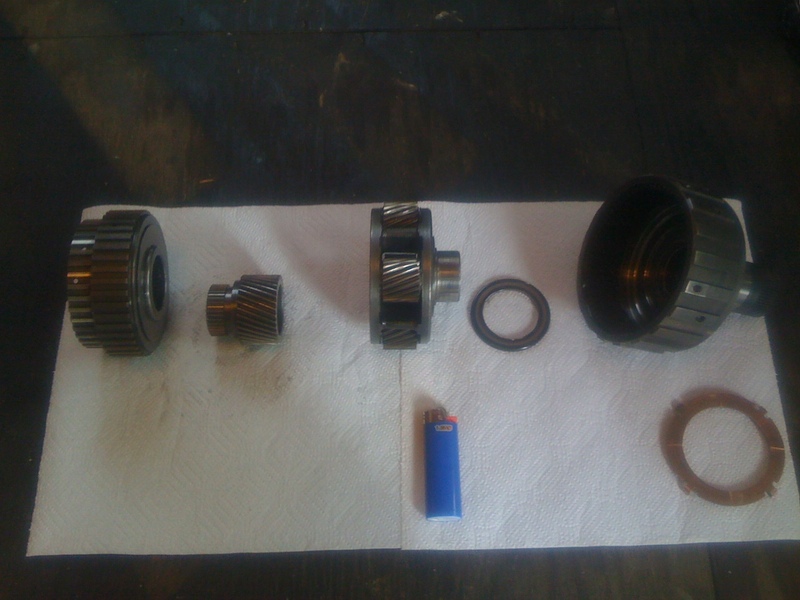 For any future reference , although the output shaft housing can be removed with the transmission still bolted to the engine , the output shaft itself is held in by a snap ring that is not reachable till you've seen such components as the input drum and others removed . 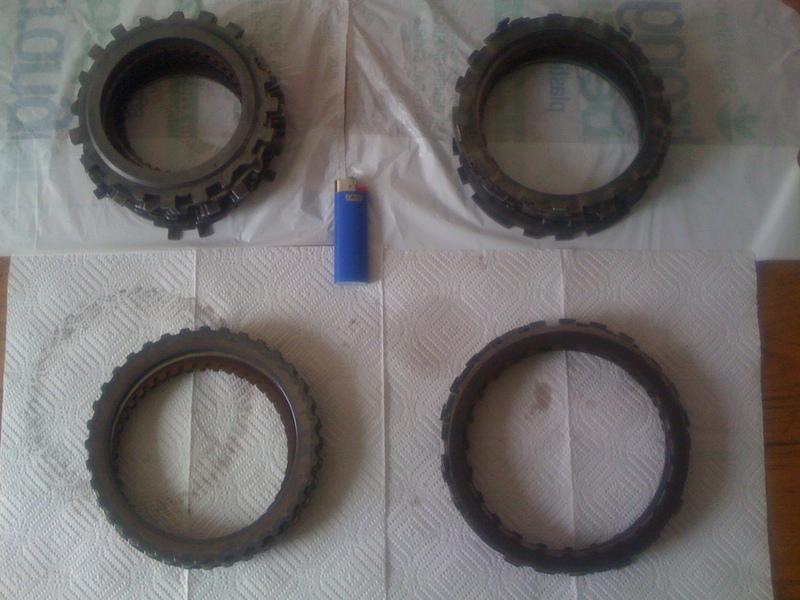 An interesting thing happened when I looked at the clutches . 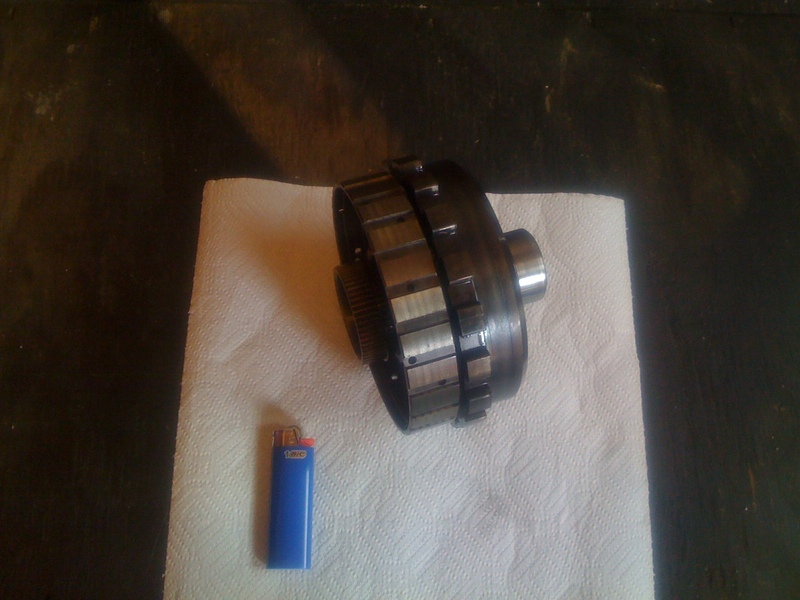 What I thought were four are actually five with the fifth being a two friction plate unit that rides on the back of a larger clutch set . 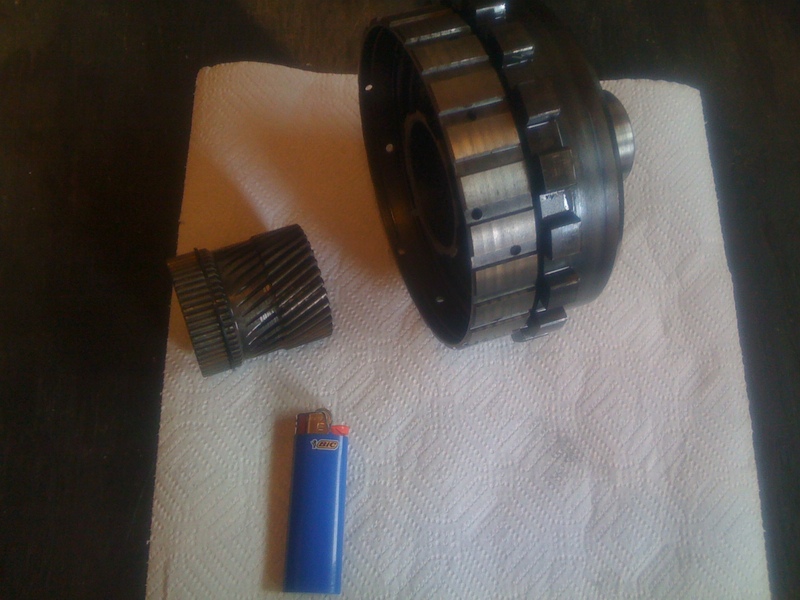 In the first picture you can see the stacks of clutch sets just as I removed them . In the second , you can see where I've fanned them out to get a look at the friction and steel plates . 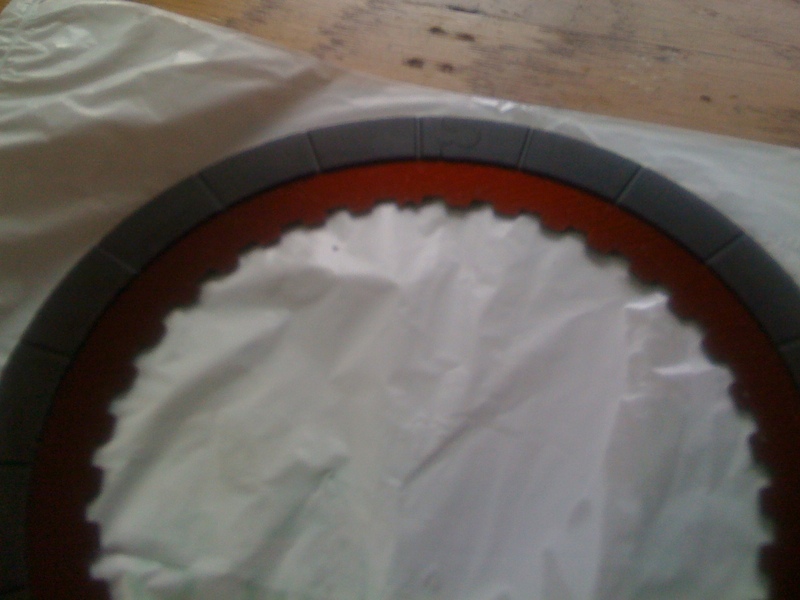 In this shot , you can see the two different kinds of friction plates I found in the forward stack . 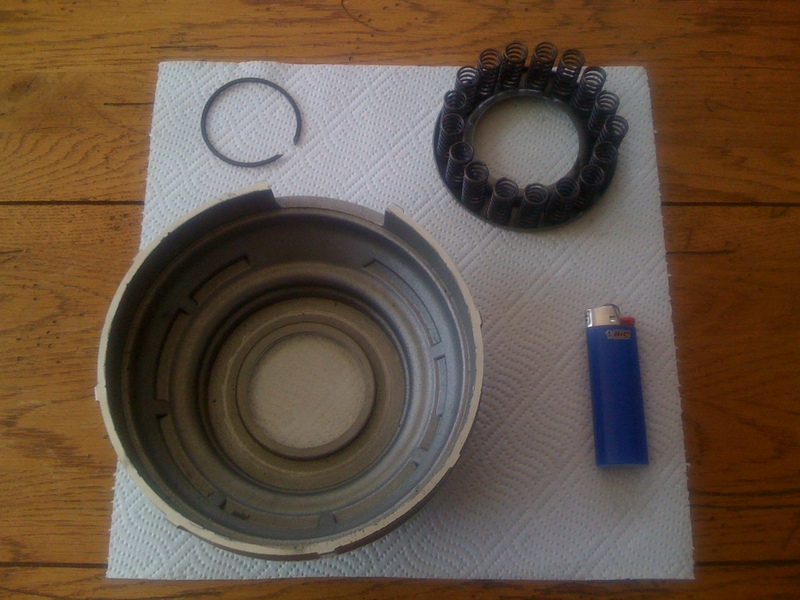 This is the clutch set that was top left of the above shots . I tried to get a good close up of the two different kinds friction material because for a high mileage unit I think the friction plates look great . 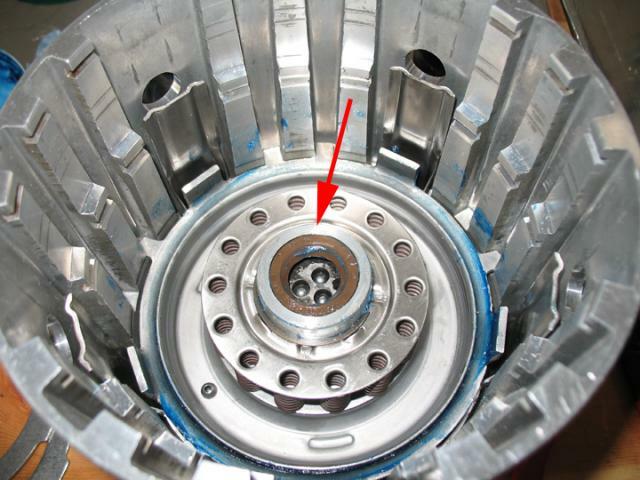 The two small friction plates are overrun clutches, they are applied when you release the gas pedal and coast (engine breaking). Thank You StealthESW . 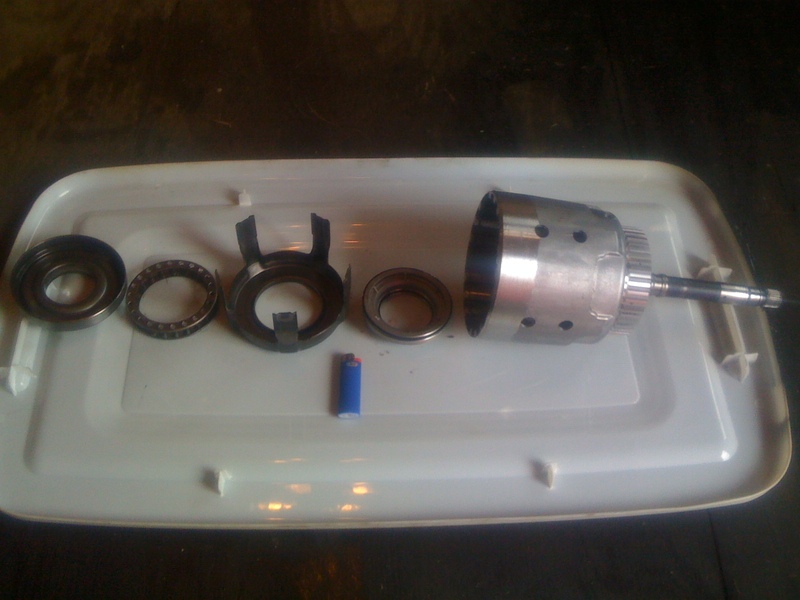 It's funny , I did find mention of the overrun clutch in some of the reference material I have been using but had mistakenly thought it was talking about the one way hub I found on the front planet set . 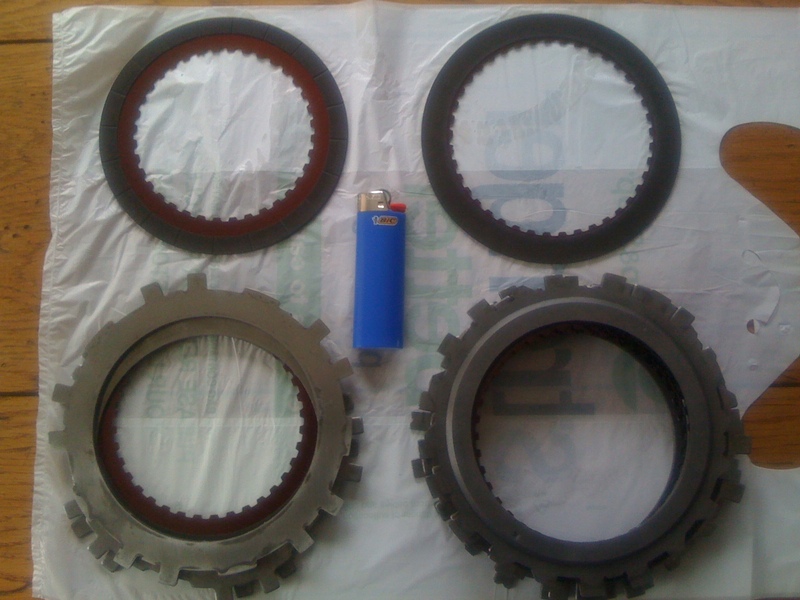 Then when I went to take these pictures and found the extra clutch I was curious enough to read some more and found that it is called as you said it , the overrun clutch . Ok , Time for some more pictures . 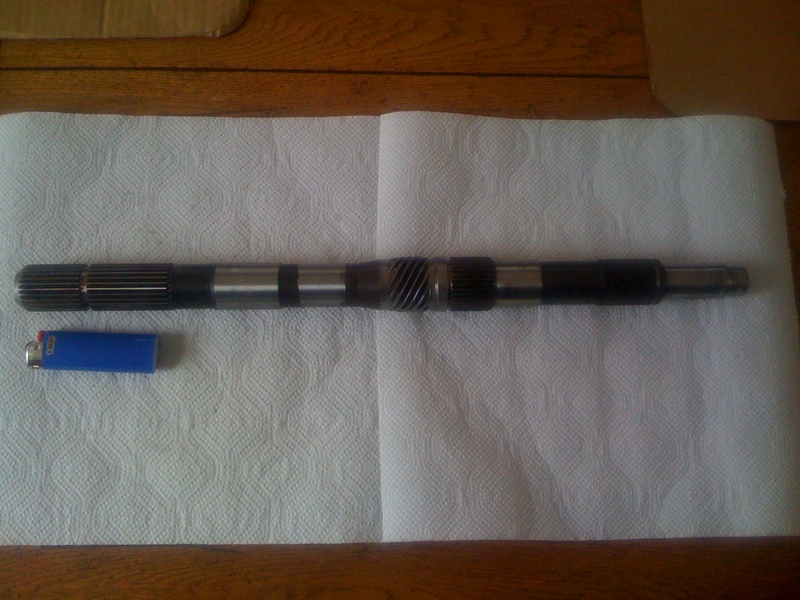 Here we have the pump just as it comes out of the front of the case . 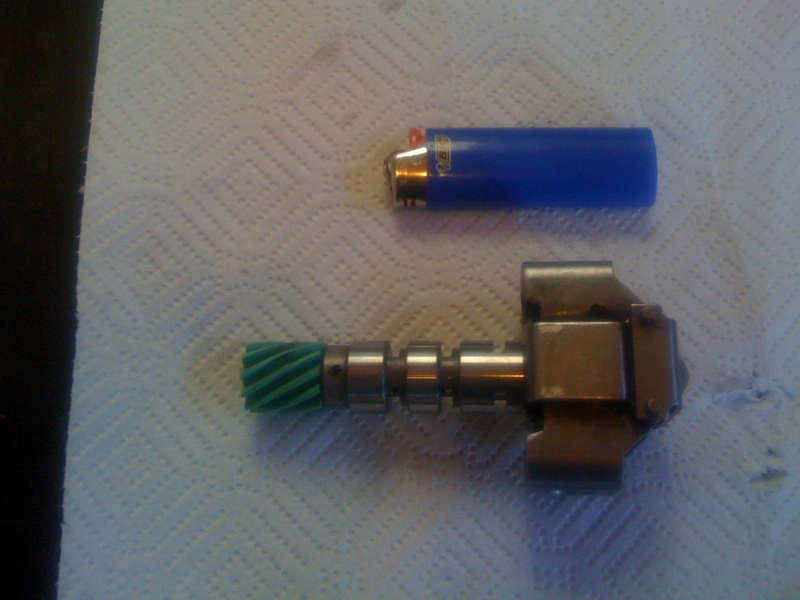 The tubing that feeds fluid to the aux valvebody is shown in the photo as well . I have pulled out the fluid strainer to show and to be honest I was really surprised when I read about this "hidden" filter . I had always believed there to be only one thing filtering the fluid in an automatic transmission , that being the one in the pan that picks up the fluid to feed the pump . This strainer from what I read is in the outlet side of the pump and of course due to location isn't a regularly serviced item so seldom seems to receive much mention . Last edited by OrangeBird; 05-03-2014 at 01:08 PM. 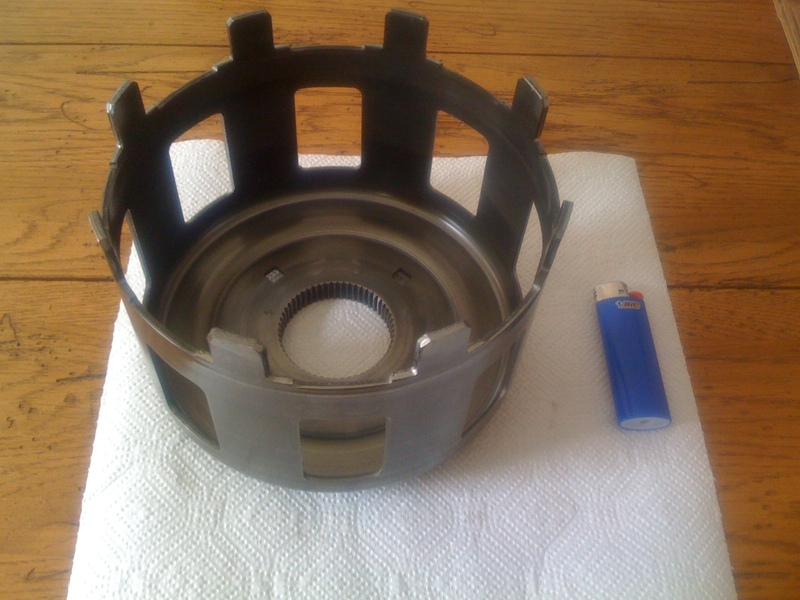 And one last shot of the strainer . One last thing to mention about the pump . 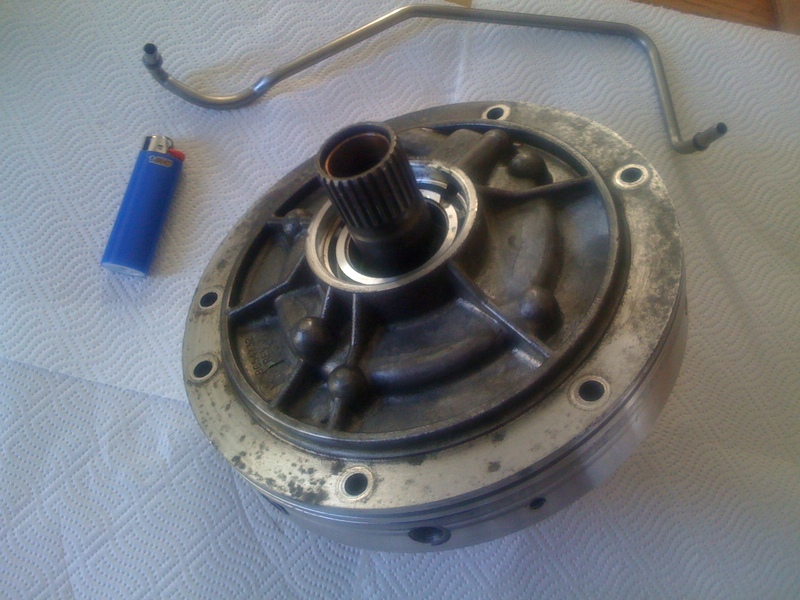 Every so often , someone makes the mistake of bolting the engine and transmission together without having the torque converter fully seated into place . 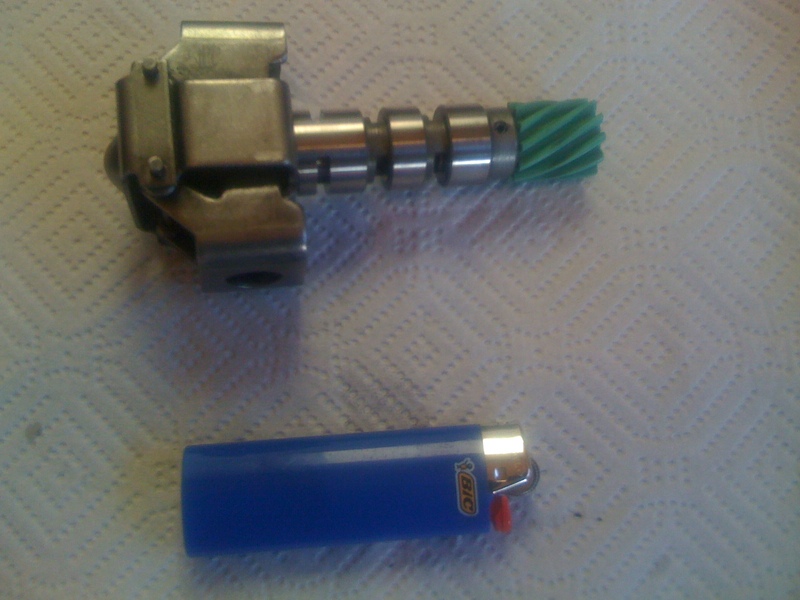 This can result in the drive tabs being sheared off of the pump and of course the pump being rendered inoperative . 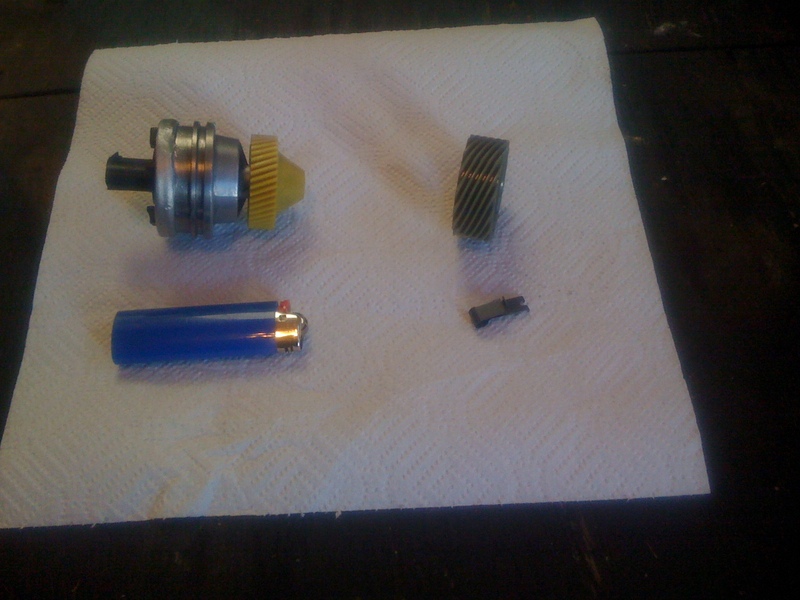 I did not disassemble the pump during this disassembly but still wanted to show what gets broken if this happens . 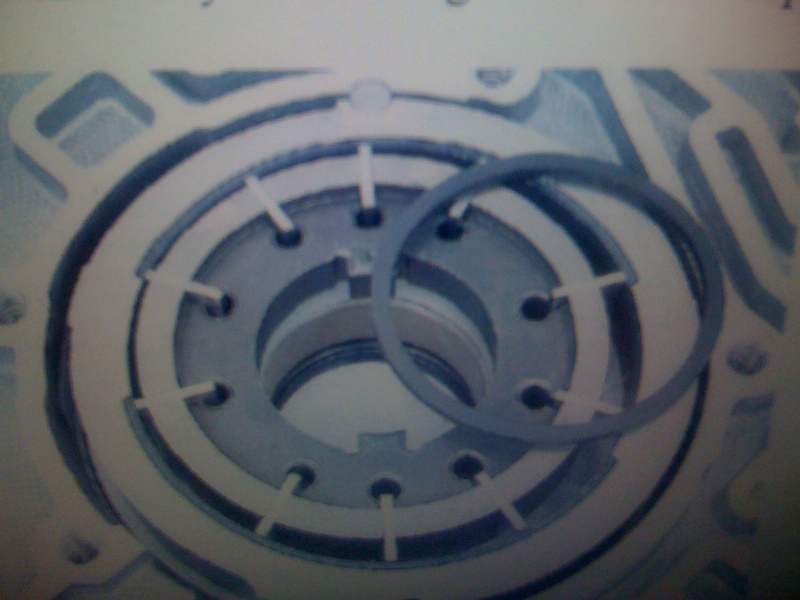 So , I borrowed a picture of the pump opened up and the parts that get broken are the little tabs at the "6" and "12" oclock positions in the middle opening of the rotor . 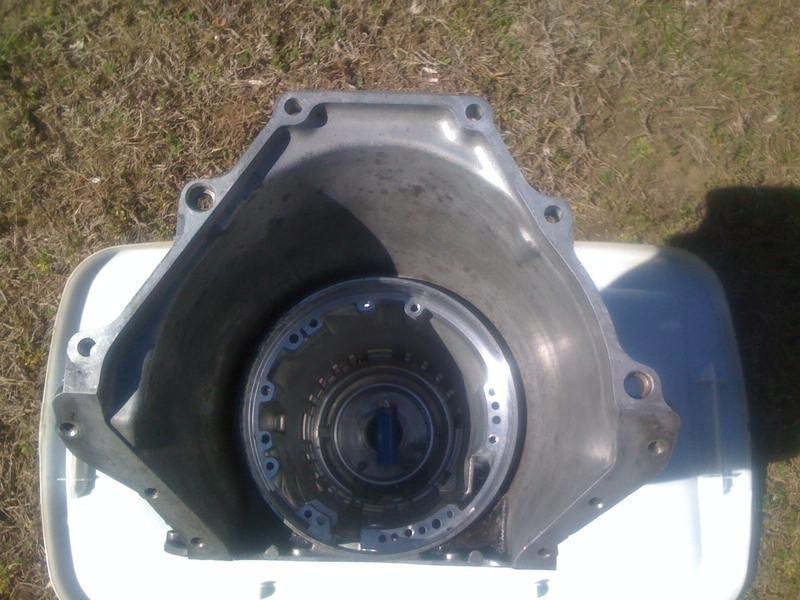 I have added a shot of the neck on the torque converter that keys into the pump's rotor drive tangs . Last edited by OrangeBird; 05-06-2014 at 08:00 PM. 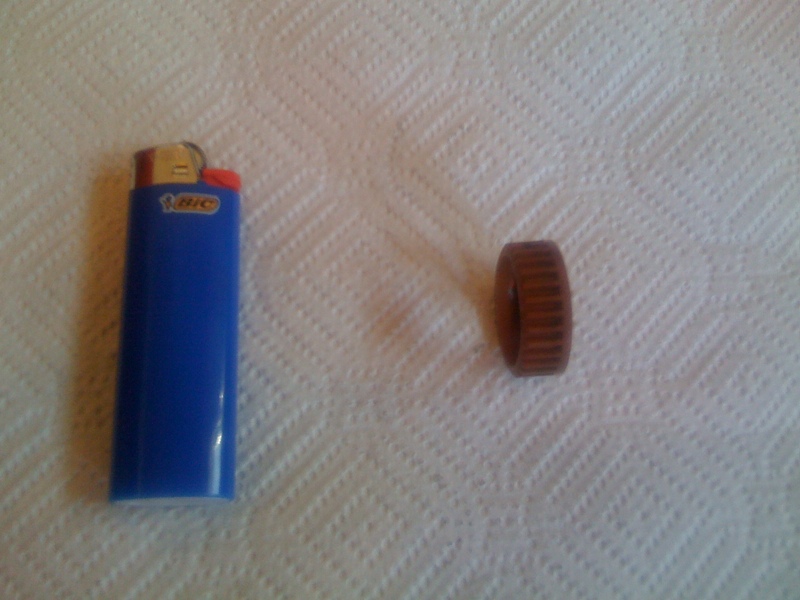 Here's the very last piece that comes out of the case . 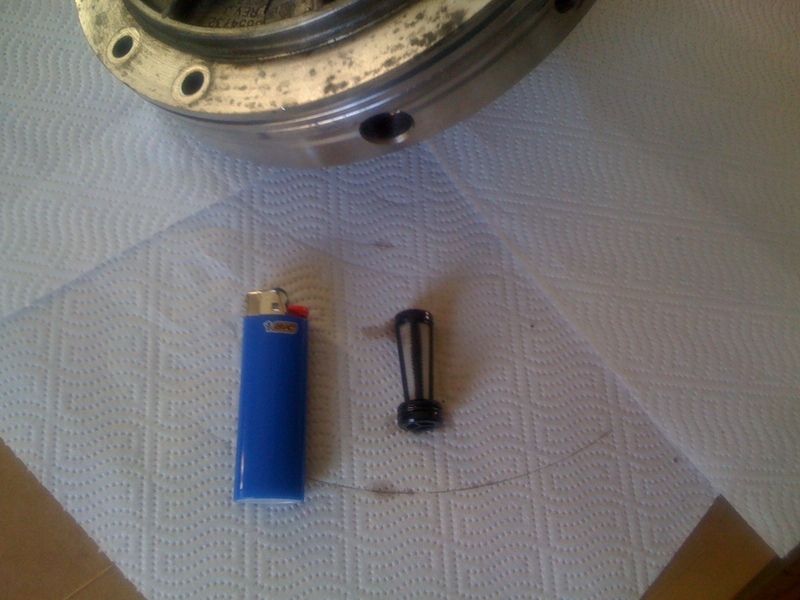 This is the low/reverse piston and it's return springs and C clip . I still have some pictures of the empty case left to show which I'll post soon .